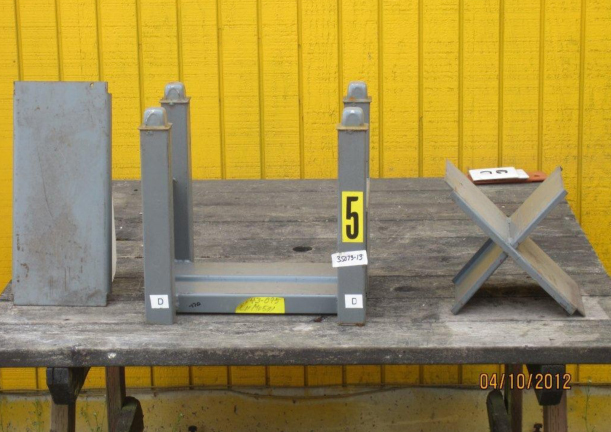 Please scroll down to view recently completed store fixture and warehouse equipment liquidations. Don’t miss out on any upcoming store fixture sales: Click HERE to SUBSCRIBE to our EMAIL LIST or RSS Feed. 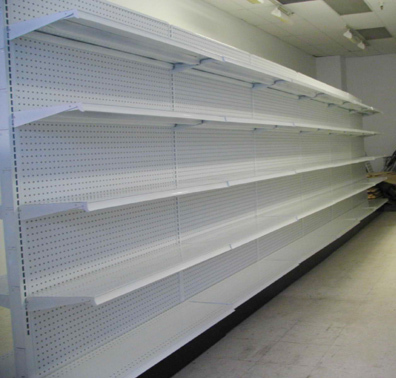 SOLD OUT: Multi-State Store Fixture LIQUIDATION. AREA: Selected National Drug Store Chain Locations in Georgia, Pennsylvania, and Rhode Island. 1) SAVANNAH GA location: SOLD OUT. 2) MILFORD PA (Hudson Valley) location: SOLD OUT. 3) NORTH WARREN PA location: SOLD OUT. 4) NEWPORT, RI location: SOLD OUT. 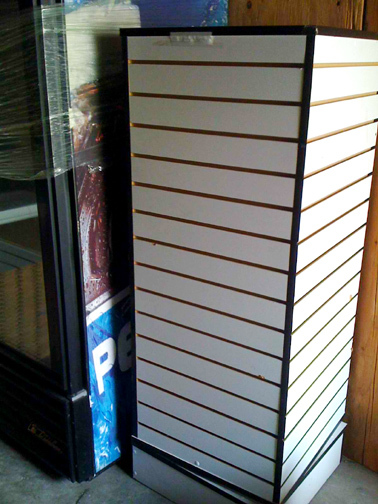 Gondola Display Shelving (in wall, island or end-cap styles). 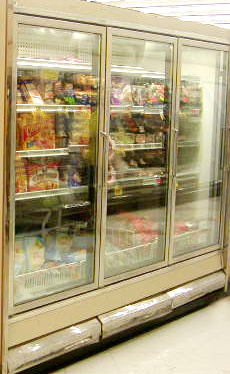 2 and 3 Door Reach-in, Self-contained, Stand-alone Commercial Refrigeration (coolers and/or freezers). Brands incude TRUE, MASTER-BILT, and more. 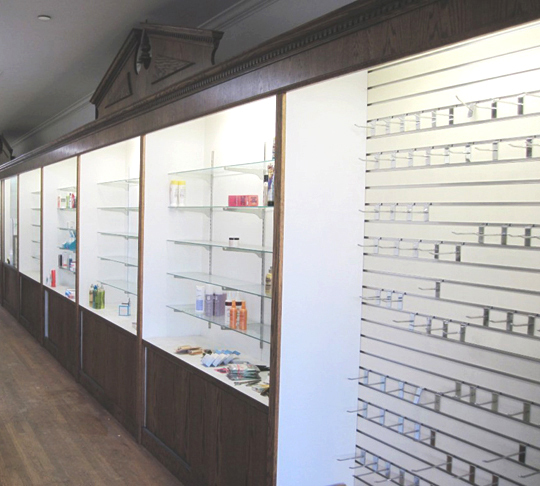 RX Pharmacy Shelving & Counters. 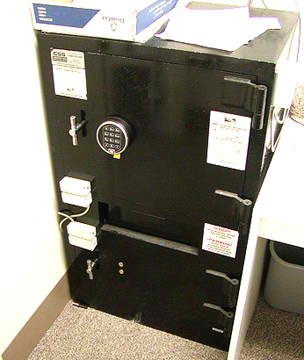 Digital Cash Safes & Check-out Counter/Wrap Stands. Security Checkpoint Towers & Power Boxes. 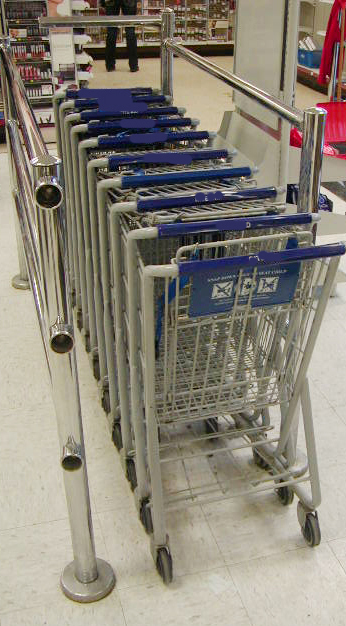 Shopping Carts & Shopping Baskets. 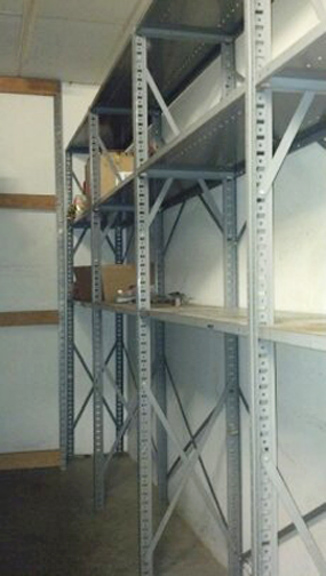 Back Room/Stock Room “Wide Span” Storage Shelving. 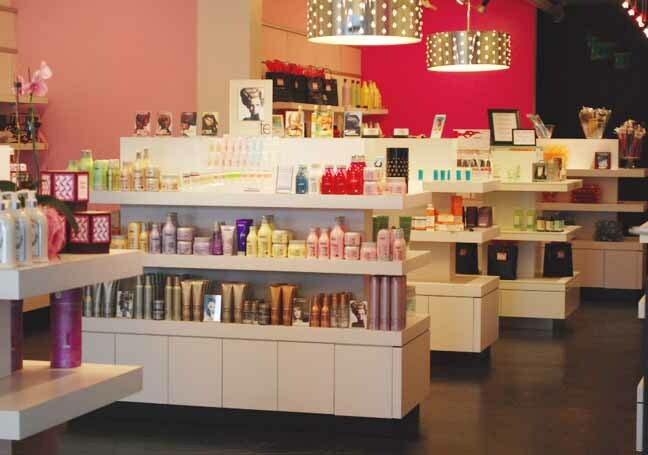 Cosmetics Display Fixtures & Racks. 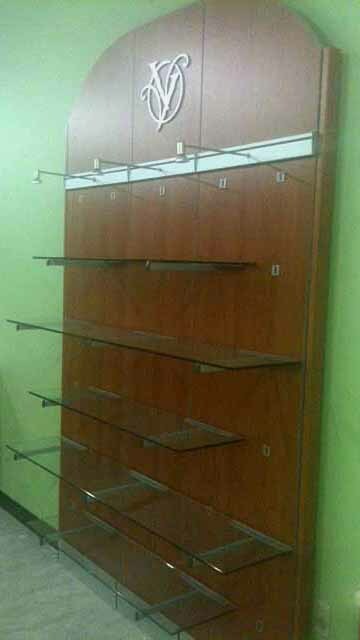 Cigarette/Tobacco Merchandisers & Display Racks. 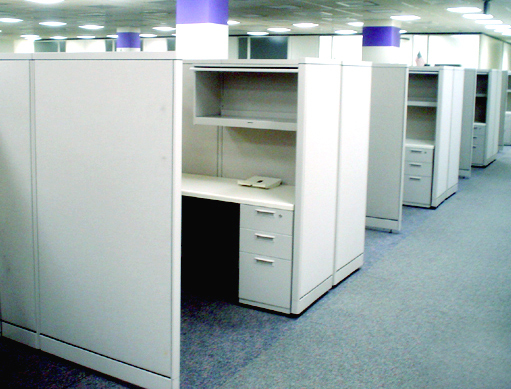 Employee Lockers & Office Equipment. 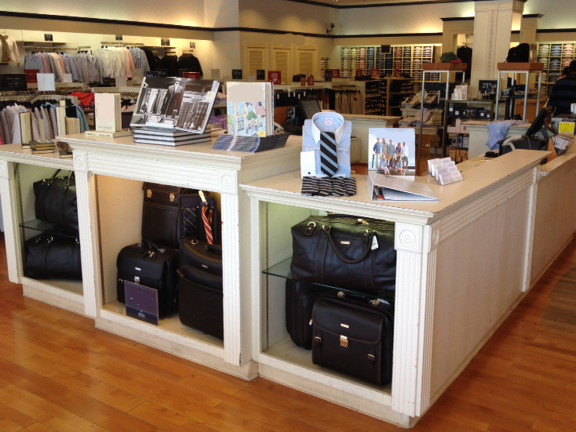 Showcases, Greeting Card Racks, and much MORE. 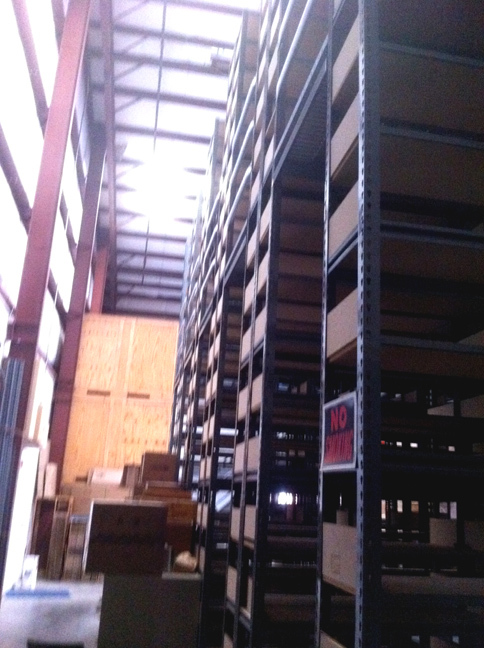 COMPLETED LIQUIDATION: Palletized Truckload Lot of Used GONDOLA STORE SHELVING. AREA: Palletized for FOB shipment. 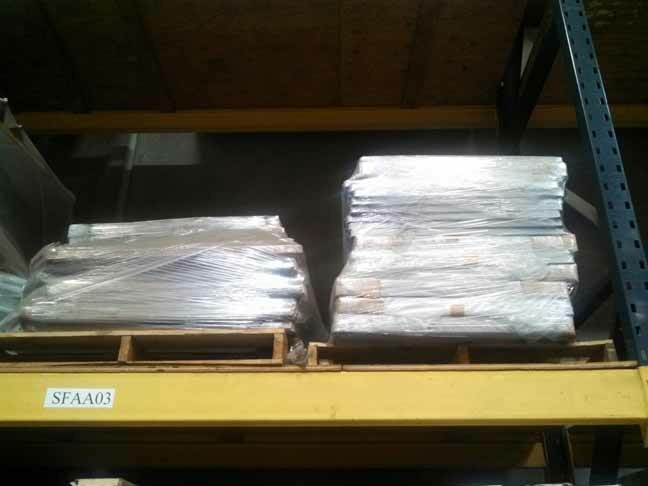 Project completed: Liquidation of 10+ truckload lot of pre-owned palletized shelving. Brands included LOZIER, STREATER, MADIX and KENT. 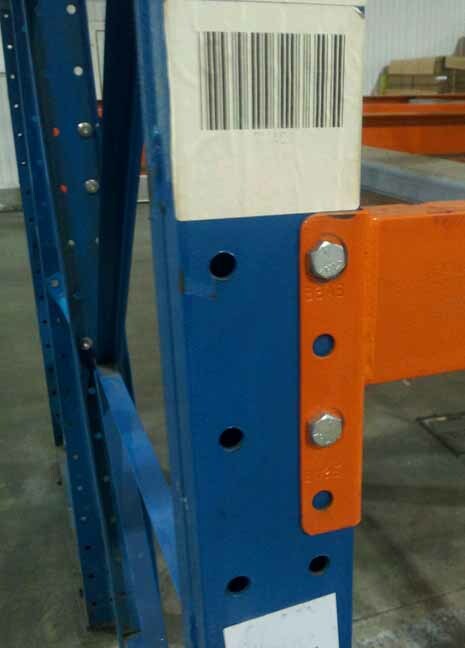 Inventory includes shelving, uprights, peg board, and parts, palletized to ship FOB. 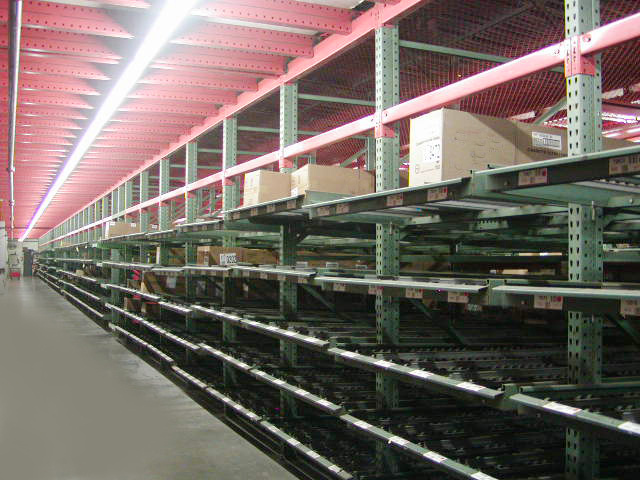 View Truckload Shelving Liquidation PHOTO BROCHURE here. 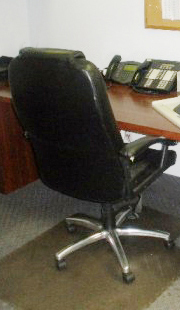 SALE COMPLETED: Corporate Office Furniture LIQUIDATION. STATUS: 3 day on-site sale has concluded. 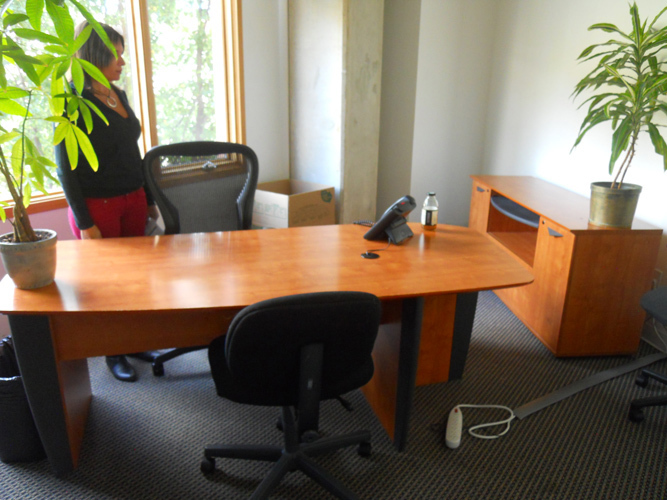 3 days ONLY — 100’s of office furniture items due to relocation. 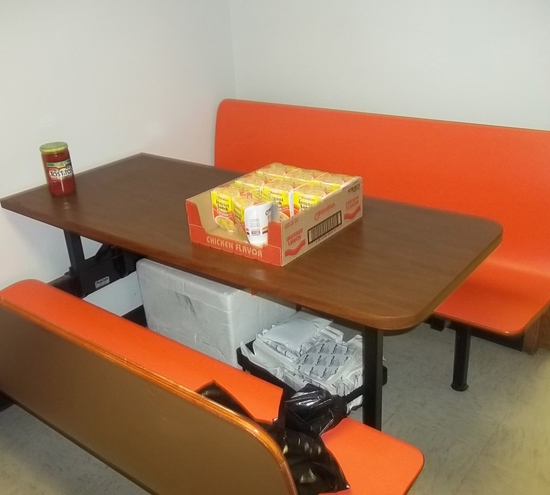 Inventory included executive/managerial/secretarial desks & chairs, office cubicle panels & cubicle components, lateral & vertical file cabinets, credenzas, bookshelves, reception area furniture, employee break room refrigerators, guest seating, televisions & media equipment, conference tables, miscellaneous office decor, and MORE. STATUS: 3 day on-site sale completed. MARKET AREA: Cleveland OH area. 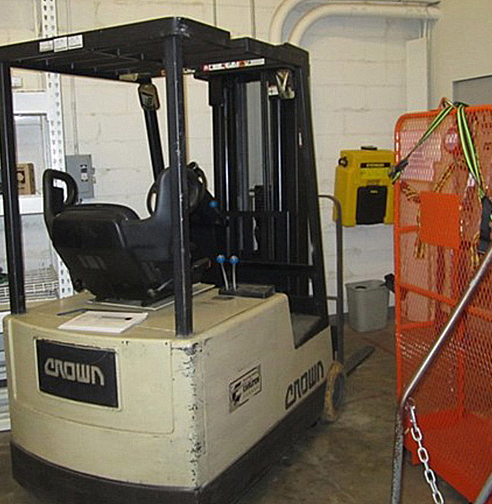 SOLD OUT: Liquidation of 74 Excess Forklifts, Lift Trucks, and Lift Equipment No Longer Required By A Big Box Retailer. AREA: 74 Locations in 27 States. 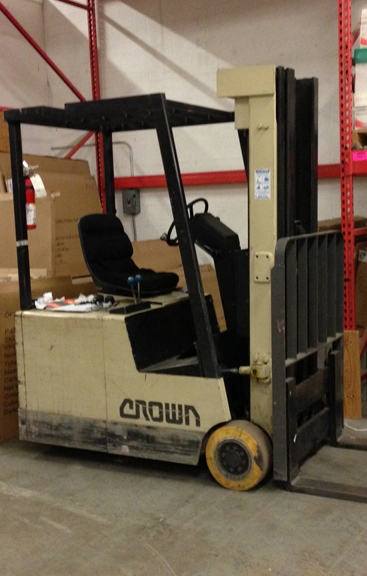 Excess CROWN & CAT lift trucks no longer required by a big box retailer at 74 locations in 27 states. 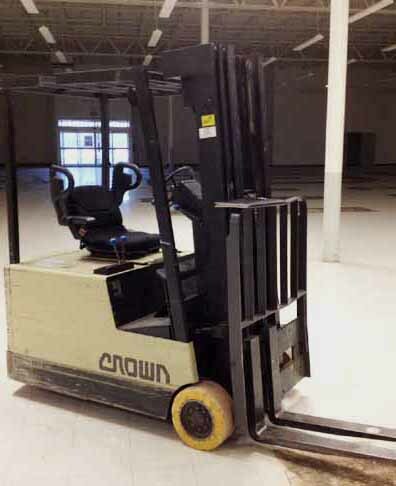 Inventory included sit-down electric rider CROWN 35SCTT or 30SCTT forklifts, 30WRTT walkie reach stackers, WAV50-84 lift tuck, and CAT F-30 forklifts. Chargers included with most units. 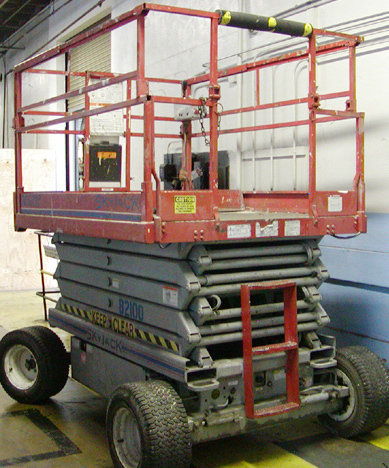 Man-lift safety cage attachments available at some locations. Locations included AL, AR, CA, CO, FL, GA, ID, IL, IL, IN, KS, KS, LA, MD, MI, MS, NE, NV, OH, OR, SC, TX, VA, WA and WY. * FLINT MI On-site Sale is now SOLD OUT. AREA: Eastern Michigan (Detroit area). Inventory included 100’s of items for your business, office, home, dorm: Desks, chairs, lateral & vertical file cabinets, mini fridges, computers, printers, monitors,TV/VCR’s, security cameras & equipment, coffee pots, massage table, cubicle office panels, break room furniture tables & equipment, projector, storage cabinets, folding tables, guest seating, pictures, speakers, floor buffer, cork & dry erase boards, ladders, stock carts, multiplexers, and much MORE. Something for everyone! 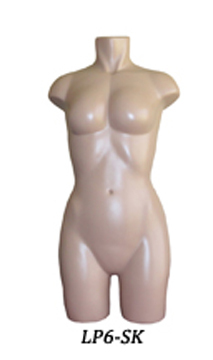 SOLD OUT: BRAND NEW Mannequins & Display Forms FACTORY OVERRUNS. AREA: FOB shipping from Vermont. Brand NEW male and female apparel mannequins and display forms at deep discounts: Overstock inventory at 60%-70% off the regular retail price! 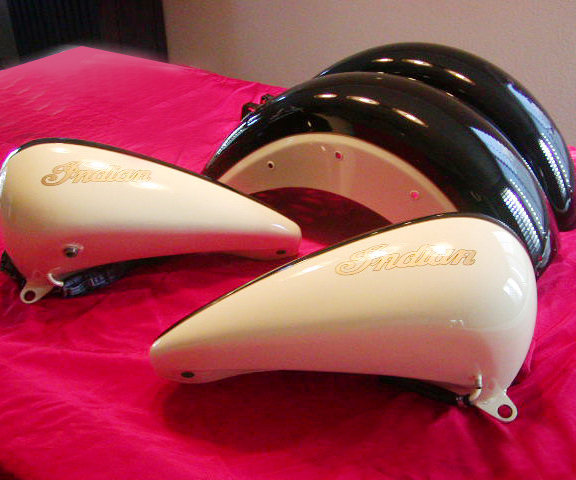 Liquidation included a limited factory overrun, with 80-240 BRAND NEW units available in each style, WHILE THEY LAST. 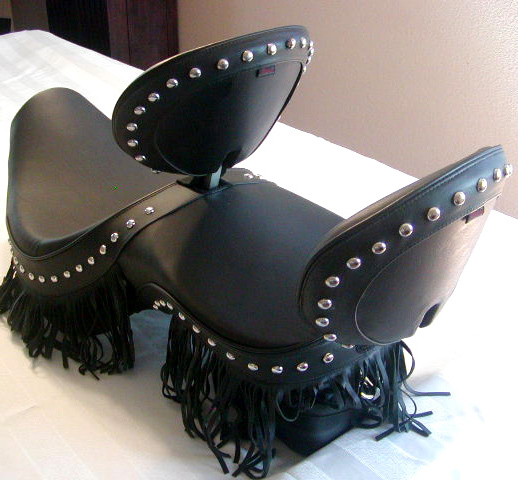 NINE STYLES to choose from, some selected styles include wigs, many include metal bases. All units were made of unbreakable polyurethane. 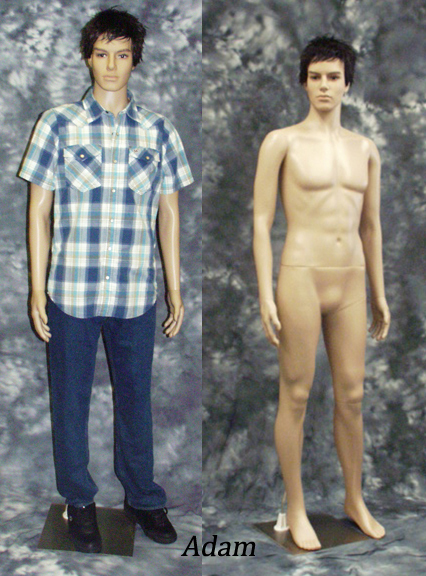 View BRAND NEW Male & Female Mannequins and Display Forms Factory Overrun Liquidation BROCHURE here. 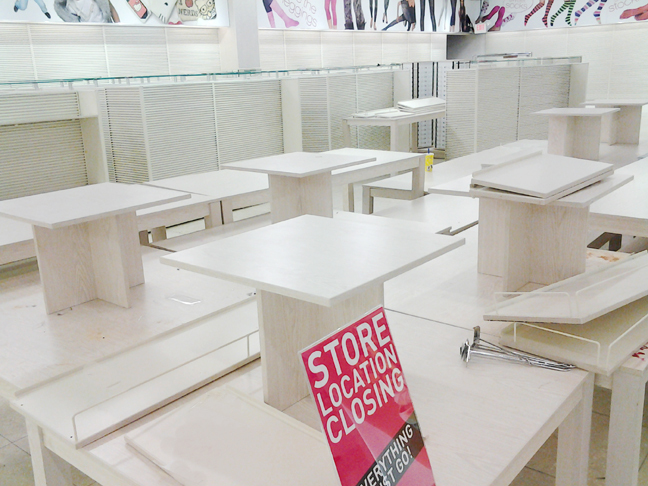 SOLD OUT: Lingerie & Intimate Apparel Store Fixture Liquidation. AREA: Queens, NY (New York City area). Inventory included hundreds of sleek, sophisticated custom and standard slat wall, mannequins, fixtures, and display racks in a wide variety of finishes, perfect for retail apparel operations. Most created 2012-2014. 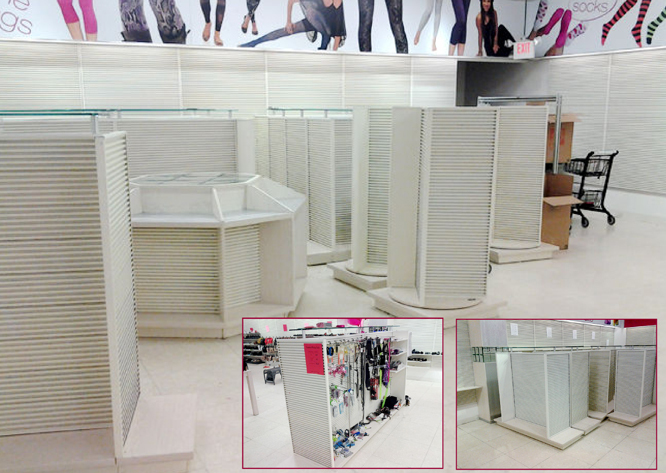 SOLD OUT: Major Department Store Fixture Liquidation. Inventory featured retail store display fixtures and racks; including garment/apparel/clothing display racks & fixtures, display tables, slatwall displays, mannequins, etageres, stockroom/storage shelving, work/pricing/stock carts, file cabinets, office furniture, employee lockers, janitorial & floor cleaning equipment, rolling warehouse ladders, pallet jacks, flat carts, and more. Metal, glass, and a variety of rich wood finishes. 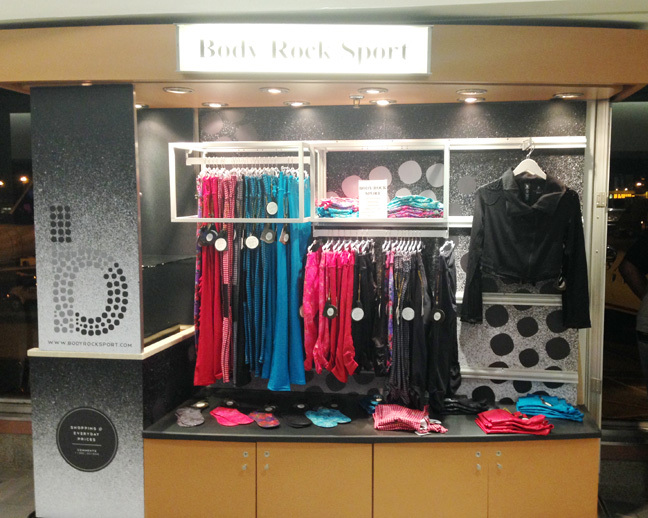 SOLD OUT: Fitness/Sports Apparel & Shoe Store Fixtures. Inventory included fresh, modern-style shelving and display racks in sleek metal and wood finishes, perfect for MANY retail operations. 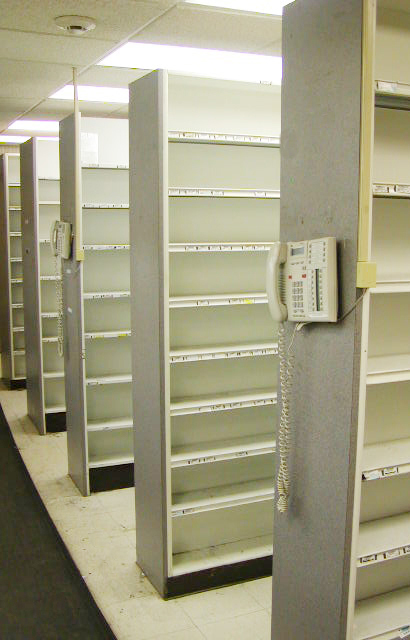 SOLD OUT: Grocery/Health Food Store Shelving & Refrigeration Liquidation. AREA: HUDSON VALLEY New York area. 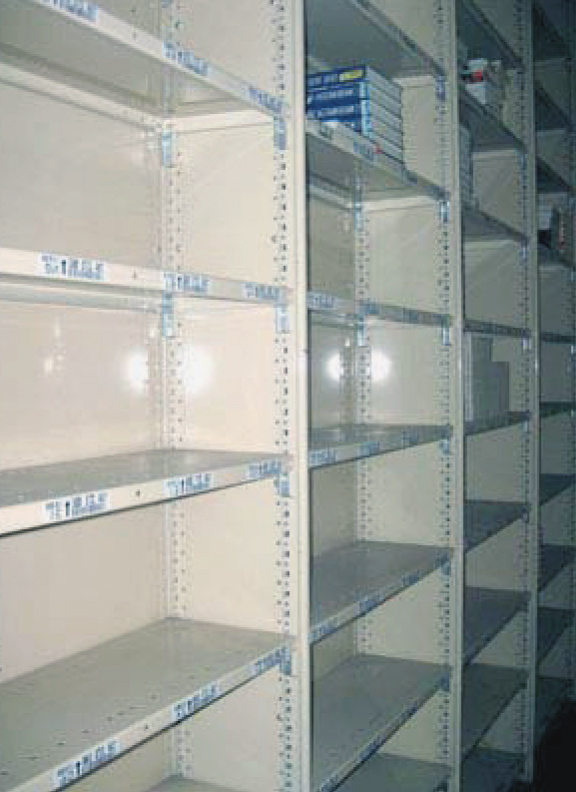 Excess gondola store store shelving and commercial refrigeration from a Hudson Valley NY area health food store is SOLD OUT. 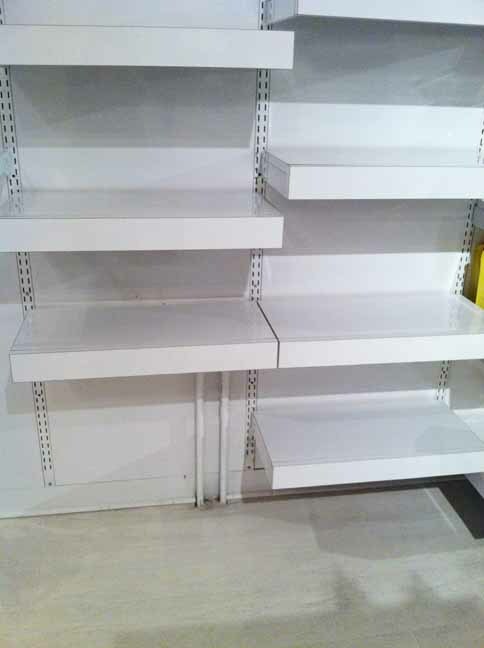 EXCELLENT condition gondola store shelving. 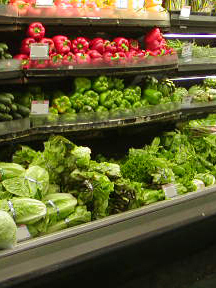 BRAND NEW never-used commercial refrigeration PRODUCE CASE. 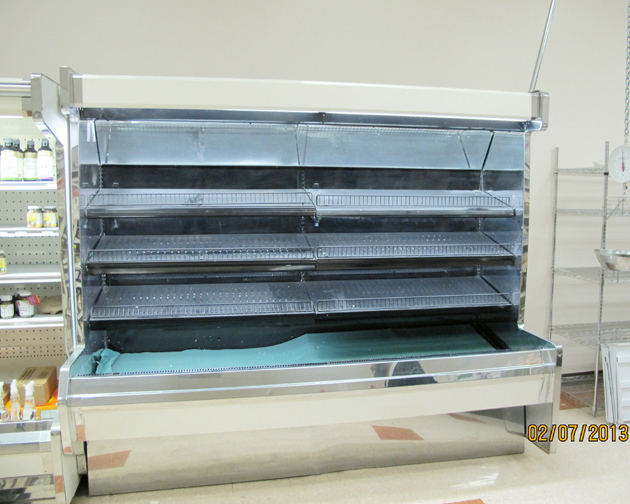 SOLD OUT: Used Deli-Grocery Store Fixtures, Refrigeration & Equipment. 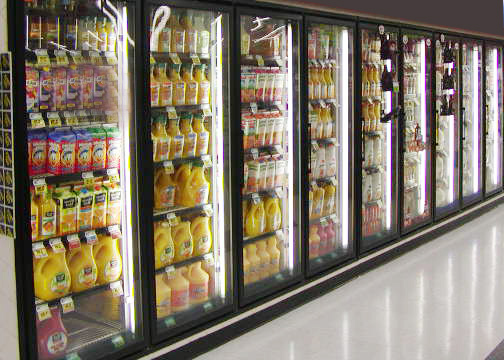 This sale featured used/pre-owned deli-grocery store fixtures, commercial refrigeration & restaurant food-prep equipment no longer required by a Chicago area retailer. Brands and manufacturers included TRUE, TURBO AIR, HOBART, BUTCHER BOY, ROYAL, CAS, CARROLL COOLERS INC (CCI), TOR REY, more. View SOLD OUT inventory list here. 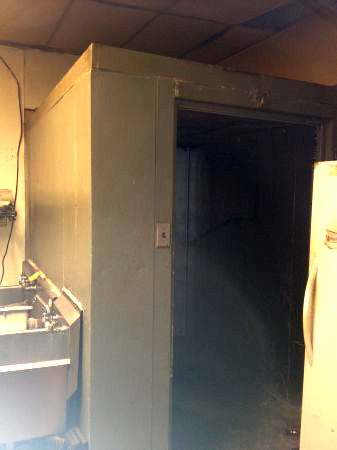 CARROLL COOLERS INC (CCI) WALK-IN cooler. 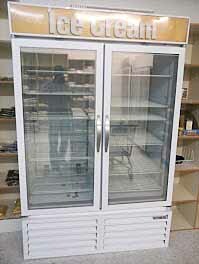 Commercial 2-door and single-door COOLERS & FREEZERS. 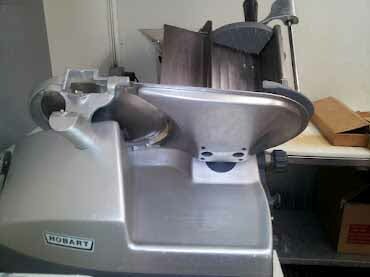 Meat & Butcher Shop Equipment, including HOBART Meat SLICER, TOR REY Meat GRINDER, and Meat SAW / BAND SAW. Commercial STAINLESS STEEL SINKS (single & 3-compartment styles). Commercial sink SHOWER HEAD and GREASE TRAP. Digital price computing SCALE & weighing equipment. CAS cash register P.O.S. (point of sale) check-out equipment. 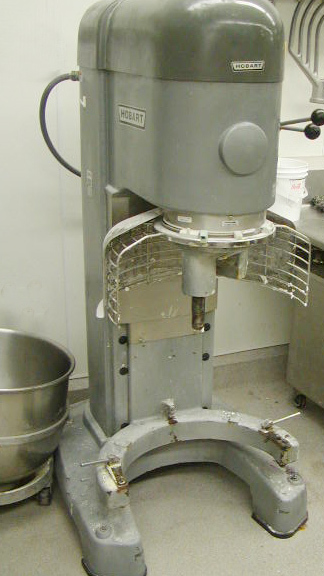 Fixtures and equipment perfect for any delicatessen, sit-down or take-out restaurant, convenience store, gourmet food shop, ethnic food store, grocery store, supermarket, butcher shop, cafe, coffee shop, pub, bar, seafood shop, or farm market. 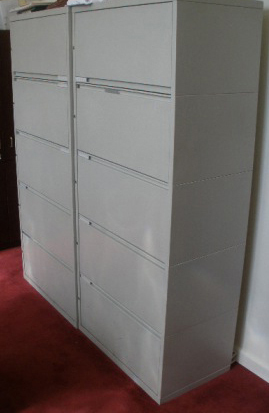 SOLD OUT: PACKAGE LOT of STEELCASE Office Cubicle Panels & Components. AREA: Los Angeles area / West Coast. 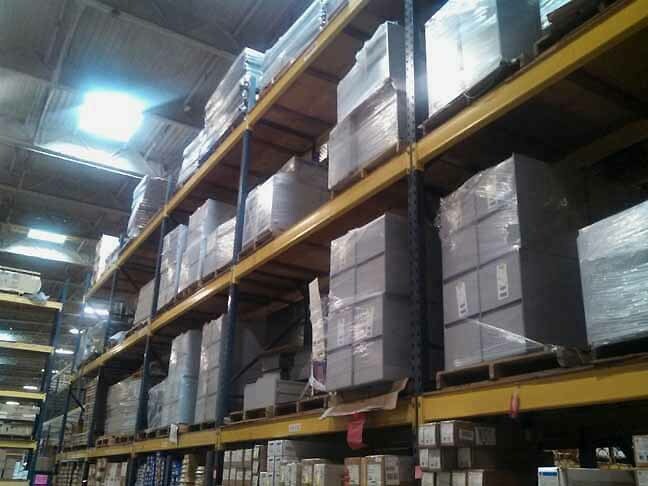 Sold out: PACKAGE LOT of excess new and used Series 9000 panel system components (panels, work surfaces, end panels, and cantilevers) no longer required by a Southern California office. 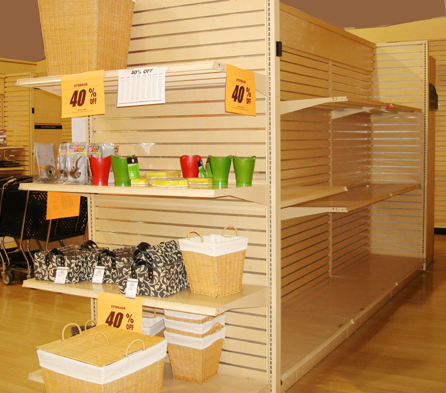 SOLD OUT: 4-Day Store Fixture LIQUIDATION Blowout Sale. AREA: NYACK NY/Rockland County/NYC area. 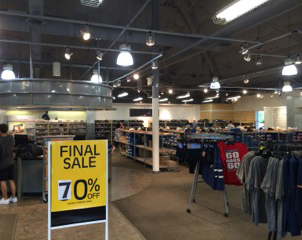 Large Women’s Accessory store closing, 4-day sale has concluded. Inventory featured sleek, modern slatwall units, display tables and fixtures in a fresh, white finish, perfect for MANY retail operations. Selection included large quantity of slatwall units (most with wheels), display tables in various sizes, and other miscellaneous fixtures. 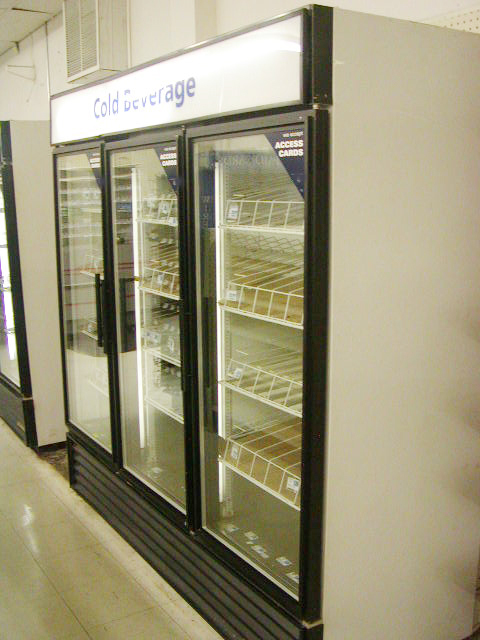 SOLD OUT: Used Commercial Walk-in Coolers & Freezer Liquidation. AREA: New Brunswick (Middlesex County) NJ. 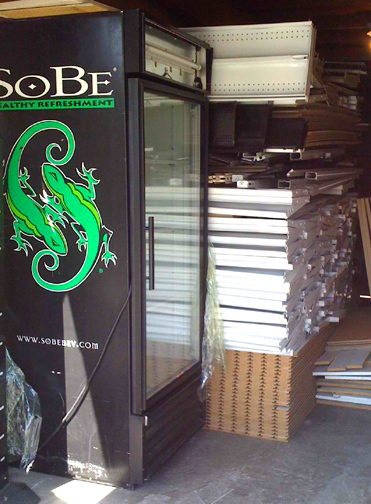 Used Walk-in Coolers & Freezer in New Brunswick (Middlesex County) NJ area are SOLD OUT. 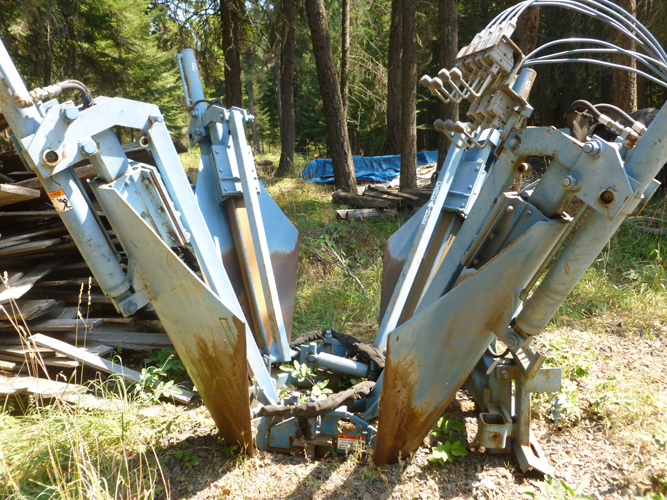 Fully-functioning units with compressors, disassembled and ready for pick up. 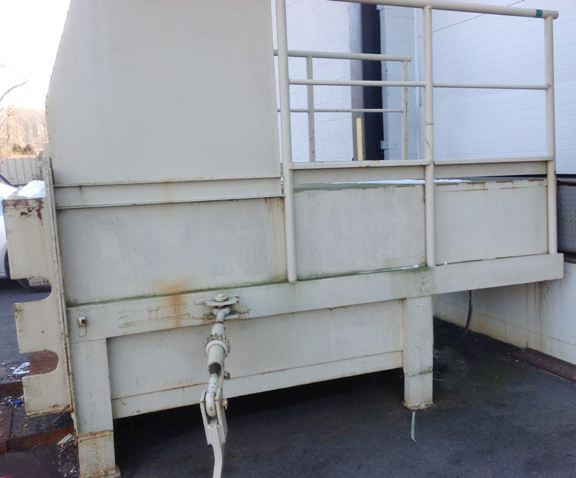 TAFCO Walk-in Cooler, 6ft x 8ft x 8ft High. Fair condition. Silver color. 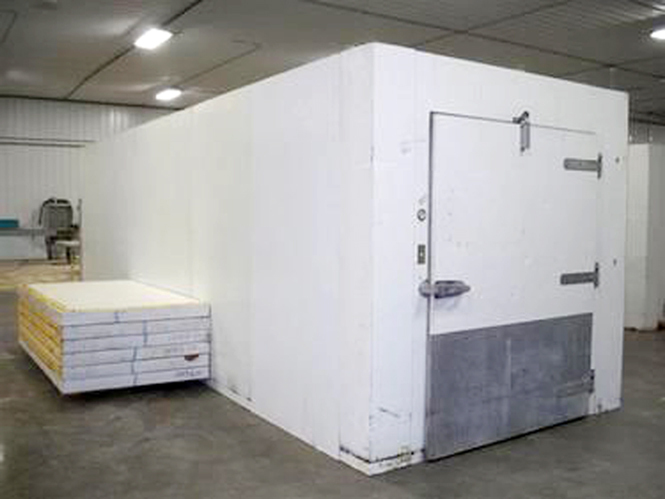 TYLER Walk-in Freezer, 7ft x 8ft x 9ft High. Excellent condition. Silver Color. 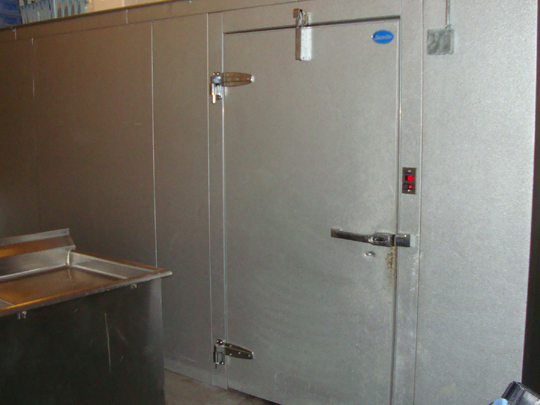 SCHULTZ Walk-in Cooler, 8ft x 16ft x 8ft High. Good condition. 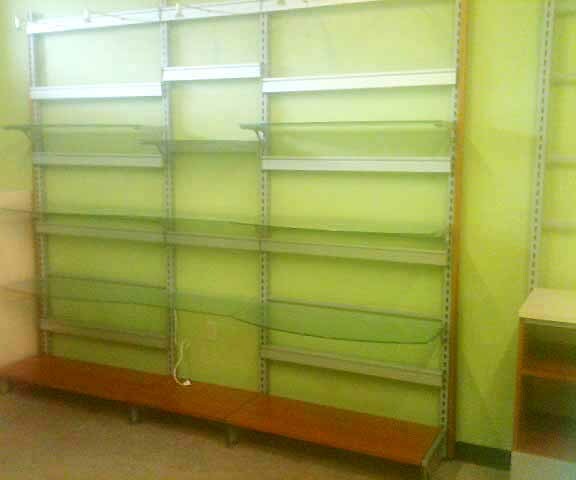 SOLD OUT: Used Gondola Shelving, Shelves, Beverage Coolers, more. Excess gondola island shelving sections, beverage coolers (commercial refrigeration), shopping carts, rotating towers (and more), no longer required by a West Coast retailer have SOLD OUT. 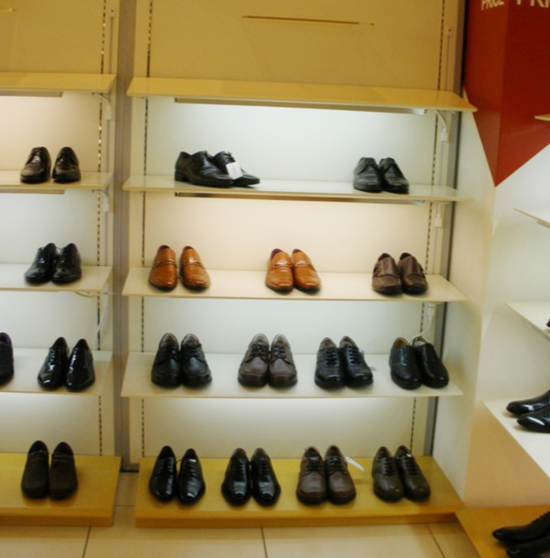 SOLD OUT: Gondola Shelving & Storage Cases from a Footwear Retailer. AREA: Palisades Park (Bergen County area), NJ. 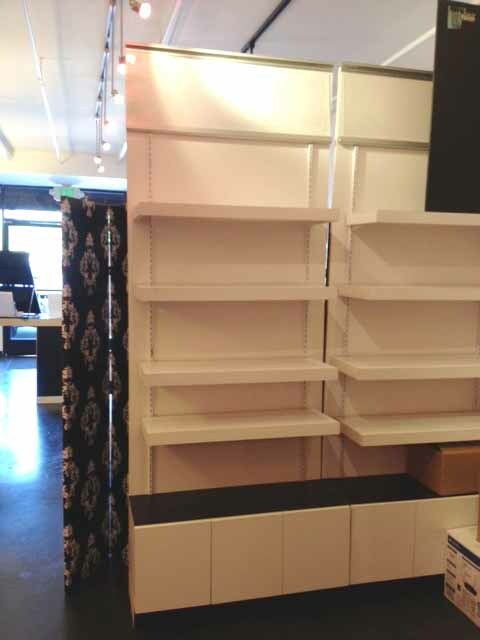 Pre-owned sleek, stylish shelving sections no longer required by a Bergen County New Jersey area retailer. Used to display and showcase footwear, but would also be great for folded apparel, gifts, collectibles, salon products, or hard goods. In beautiful neutral finishes, suitable for any retail decor. 15 Island Gondola Shelving sections (52” x 31.5” x 43”). 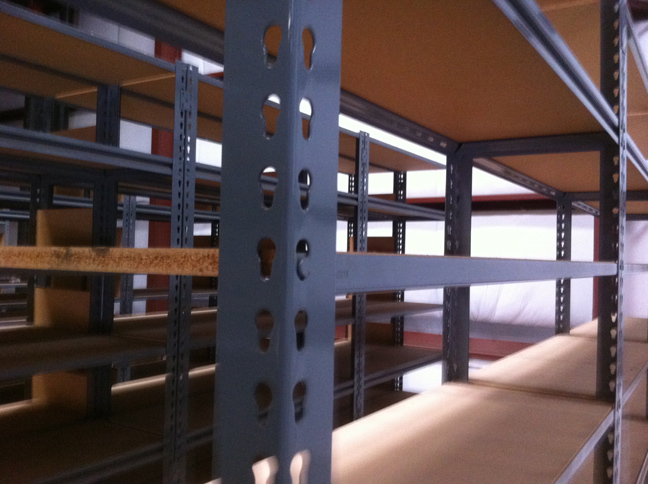 10 Island Gondola Shelving sections (55” x 30” x 54”). 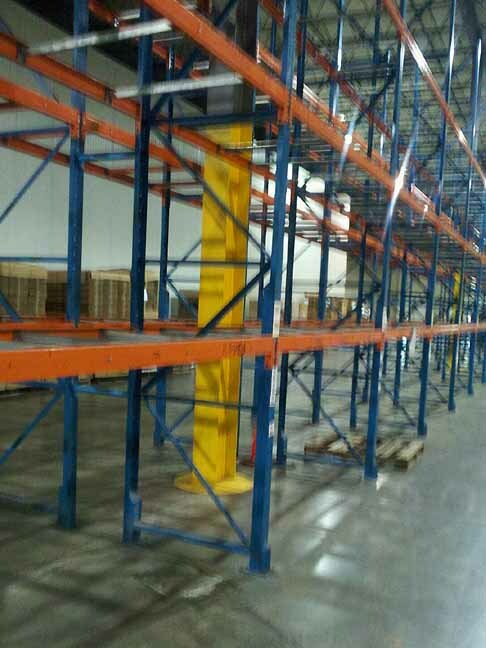 27 Wall Shelving sections (86” x 53” 16”). 25 Storage Cases (45” x 18” x 20”). 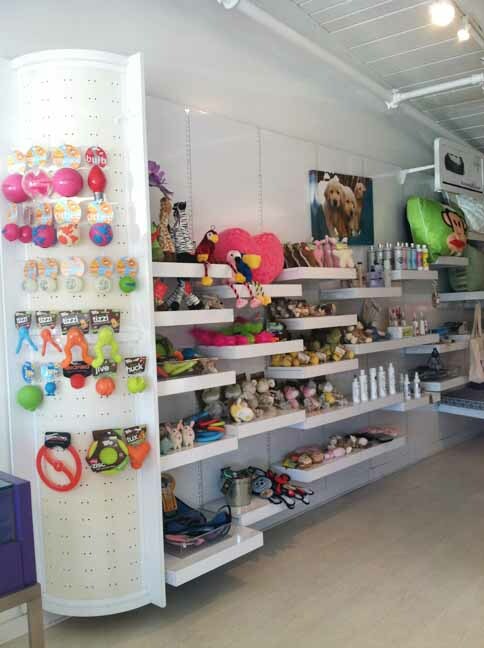 SOLD OUT: Upscale Pet Boutique Store Display Fixtures. AREA: Palo Alto, CA (San Jose/Northern CA area). Fresh, modern-style shelving and display racks in a sleek white finish, perfect for MANY retail operations. 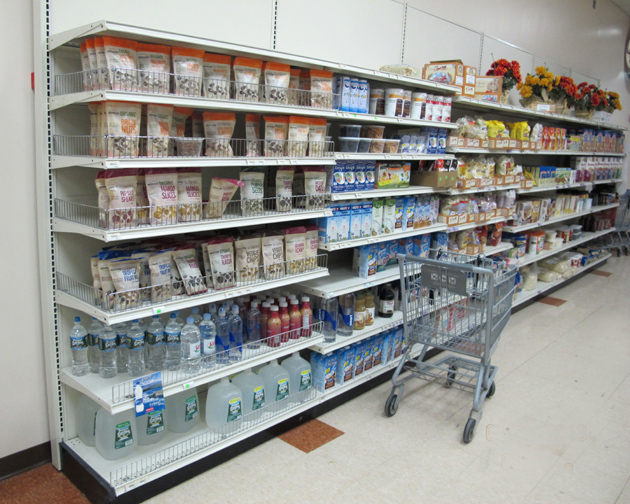 Clean “Floating Look” Display Shelving Systems. Unique Curved Corner Peg Hook Display. 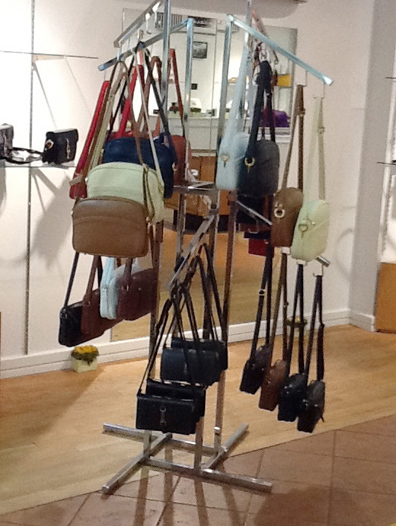 Hanging Apparel & Shelf Displays. Dog Grooming Work Tables, and more. 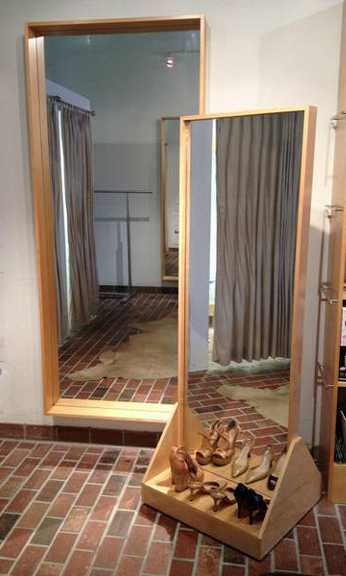 SOLD OUT: Pre-owned Upscale Retail Store Fixtures. AREA: New York City, NY. 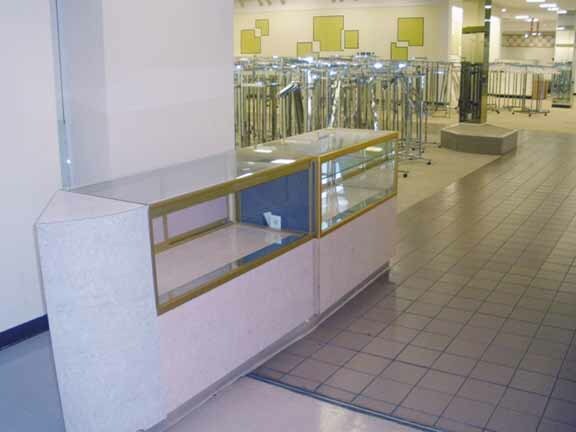 Inventory included a LARGE quantity of used retail store display fixtures and racks; including showcases, display cases, waterfall-arm accessory display racks, glass shelving, guest seating (chairs, stools & sofa), stock room/storage shelving, file cabinets, office furniture and equipment, and more. Metal, glass, laminate, wood, and upholstered finishes. 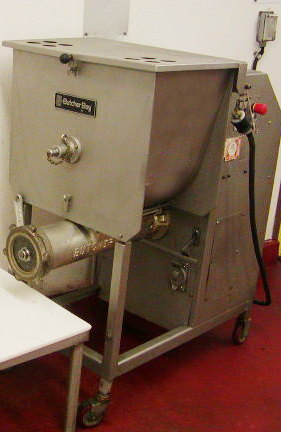 SOLD OUT: Butcher Shop Meat/Deli Equipment & Commercial Refrigeration LIQUIDATION. AREA: New York City/Long Island area. SOLD OUT! Long Island NY area butcher shop QUITTING BUSINESS after 2 years. 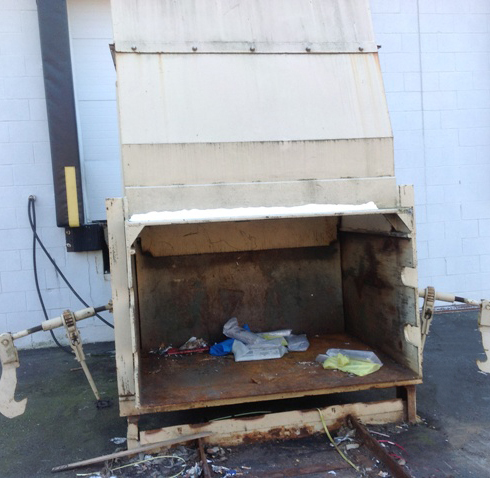 Fixture & equipment liquidation inventory included commercial refrigeration for meat/fish/dairy products, walk-in cooler (already disassembled for easy removal), meat cutting equipment, and MORE. These food prep fixtures, meat equipment, and refrigerated display cases were only 2 YEARS OLD. Click on any photo to view LARGER image. 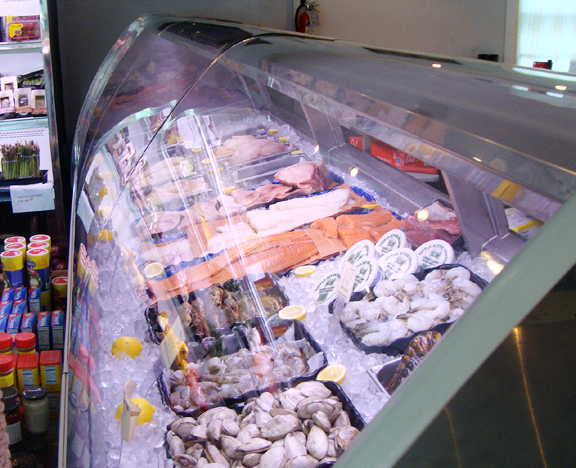 12FT STARK Refrigerated Fish Display Case. 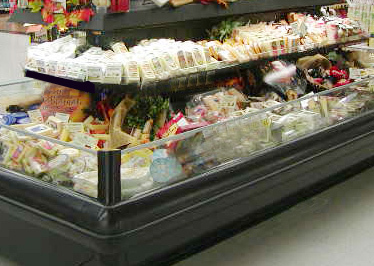 TWO 8FT Refrigerated Meat Display Cases. 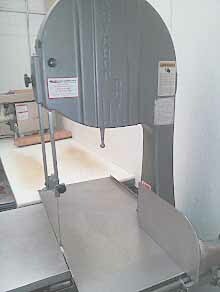 BIRO 3334 Meat Band Saw. 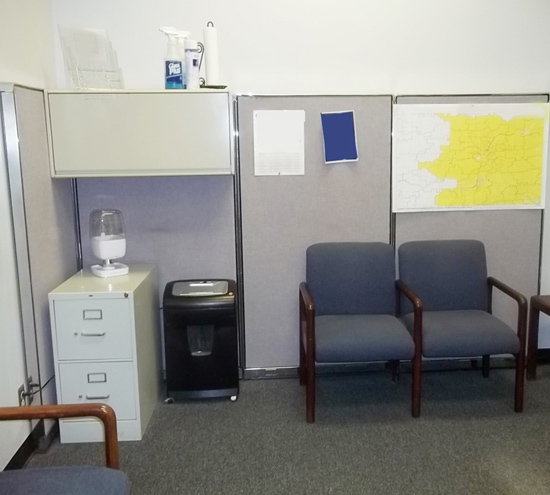 12 x 16 WALK-IN Unit (with all necessary equipment). TWO Stainless Steel Triple-bowl Commercial Sinks. 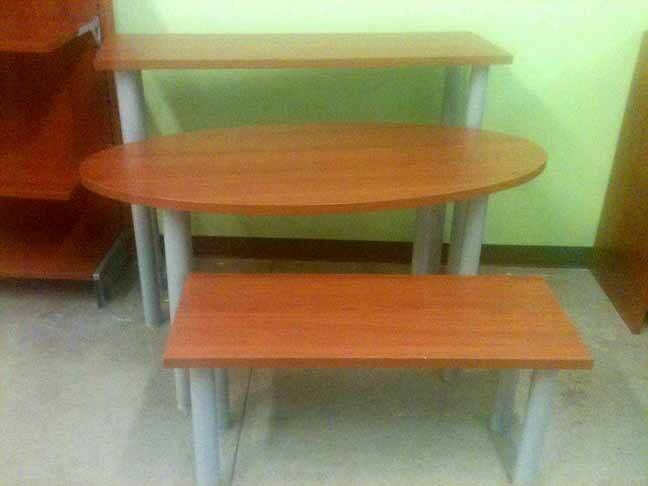 Miscellaneous Tables, Racks, and Equipment. 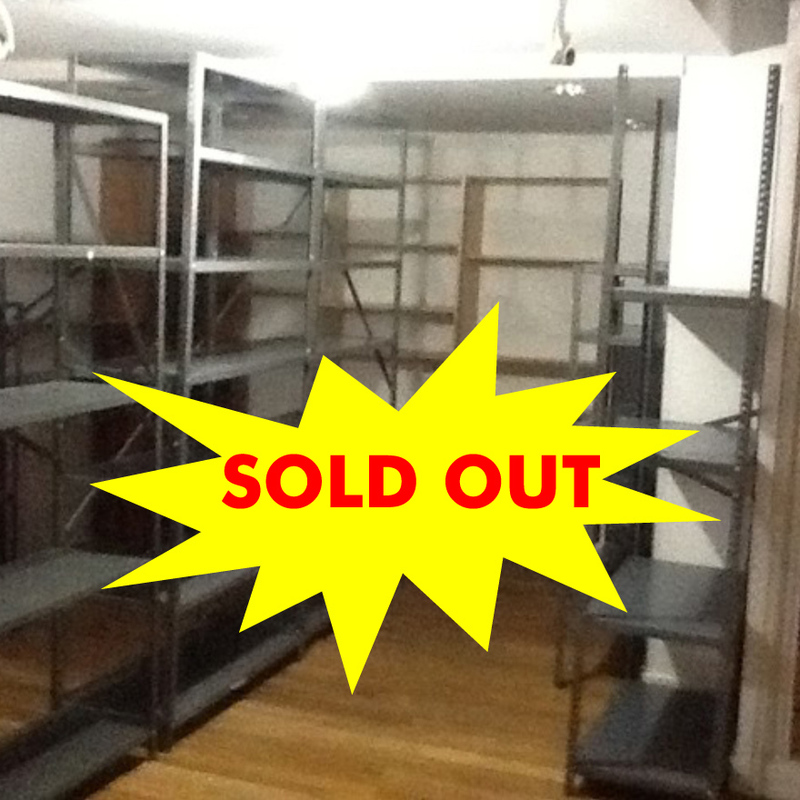 SOLD OUT: Garment Racks, Slatwall, and Mannequin LIQUIDATION. High-end Atlanta-area apparel & accessory boutique store clothing displays & fixtures are SOLD OUT. 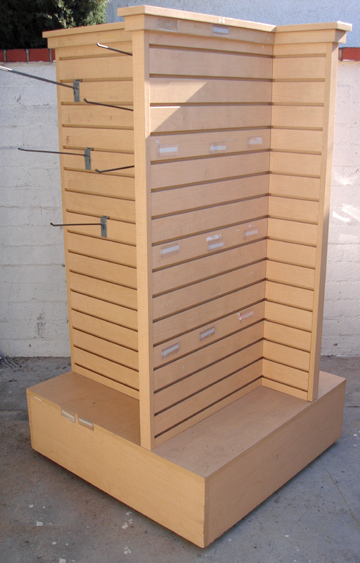 Stylish, upscale garment/apparel/clothing display racks & fixtures in GREAT CONDITION. CLICK ON any photo to view larger image. 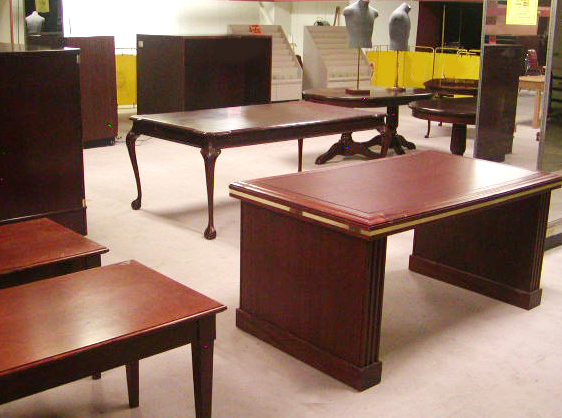 Selection included pre-owned/used display tables, slat wall & accessories, mannequins/mannikins, etagere display towers, shelving, and MORE — in metal, chrome, glass, and rich cherry wood finishes, perfect for any shop or retail operation. Many featured attractive scroll embellishment details. 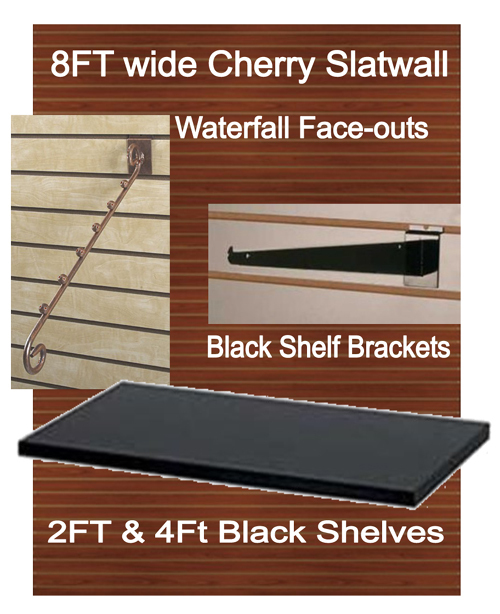 Slatwall accessories: 2FT/4FT shelves, shelf brackets, waterfall face-outs. 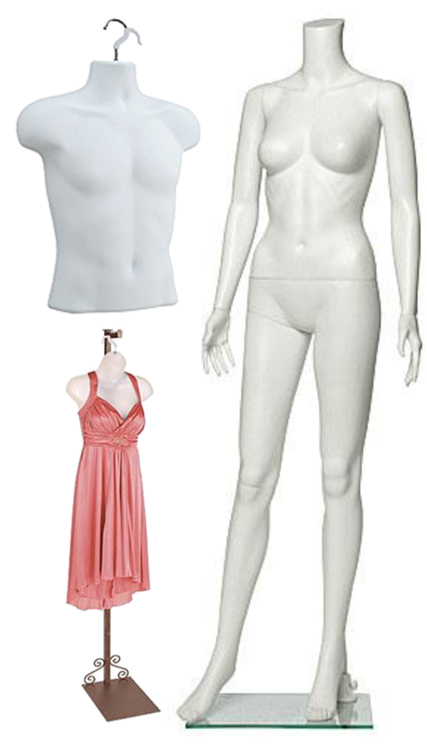 Female MANNEQUINS in full body, torso, and hanging costumer styles. Male MANNEQUINS in torso styles. 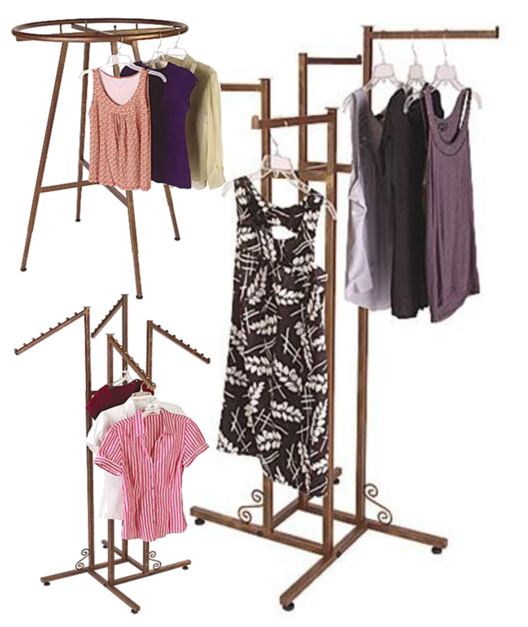 4-WAY garment racks in straight-arm or waterfall arm styles. 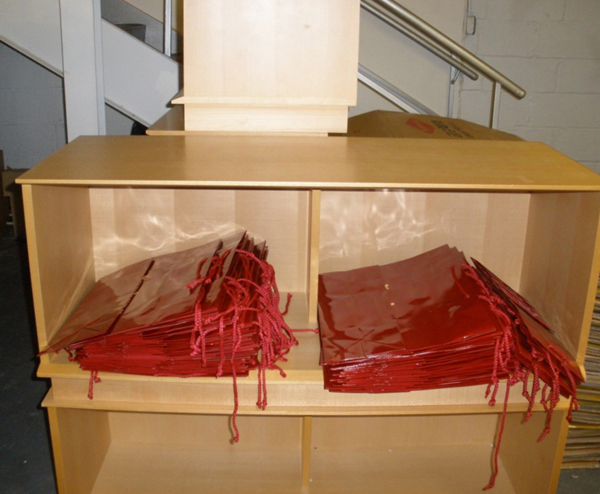 Cherry finish WOOD TOPPERS (for round garment racks). 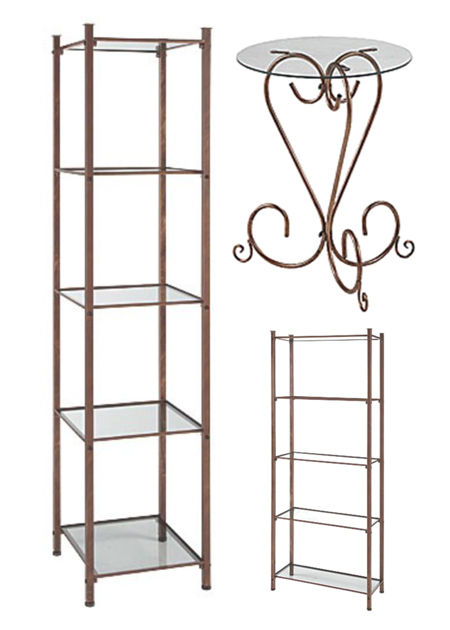 Glass & metal DISPLAY tables, shelving, and etagere towers. 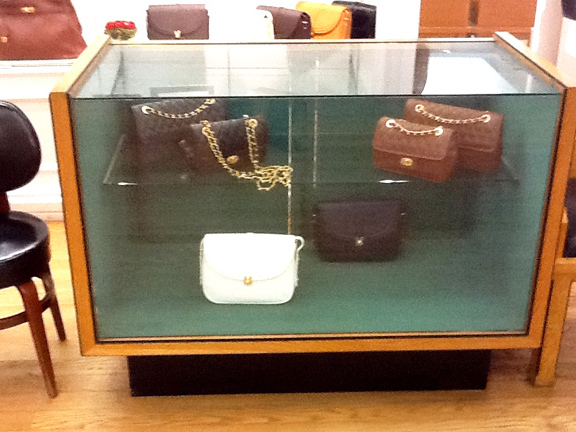 Wood and Glass CORNER-style DISPLAY CASE (with shelving). L-shaped wood & glass SHOWCASE / WRAP-STAND, with angled corner. SOLD OUT: BRAND NEW Adult Male Half-body Mannequin LIQUIDATION. 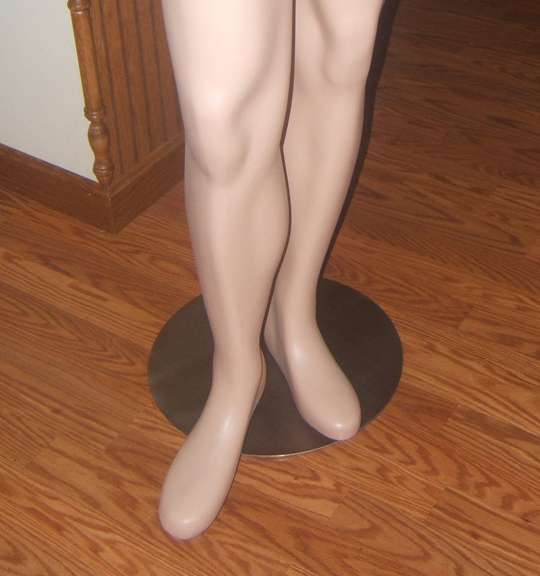 BRAND NEW half-body adult male torso leg form mannequins. 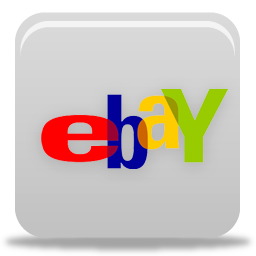 Bulk quantities at “used” prices, at a fraction of the cost of NEW! 43″ high, STAND included, BRAND NEW in box. 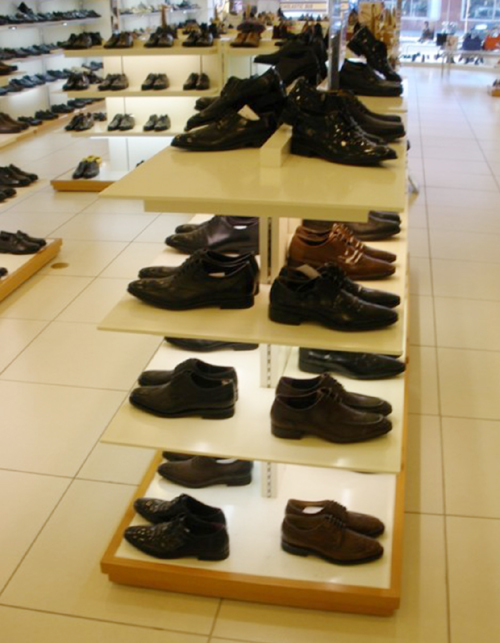 Mannikens PERFECT for men’s clothing or accessories displays, pants, slacks, bottoms, underwear, socks, shoes, boots, hunting, or fishing/sports apparel. 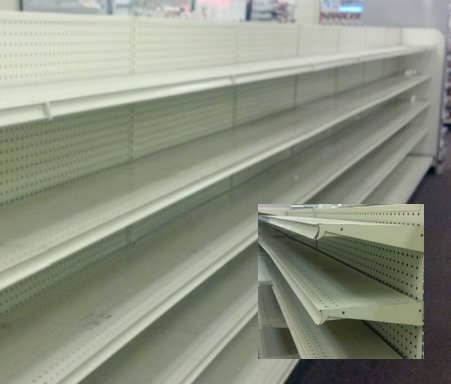 Excess MADIX shelving no longer required by a West Coast retailer is SOLD OUT. 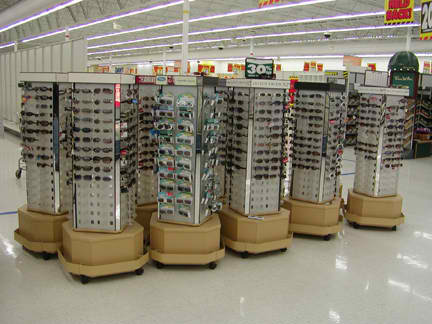 Shelving included island, end-cap, and wall style sections, and wheeled quad display units. 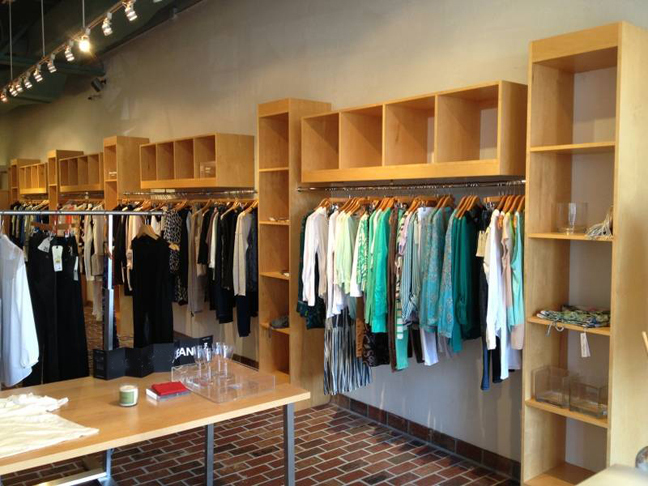 SOLD OUT: Upscale Retail Apparel Store Fixtures. 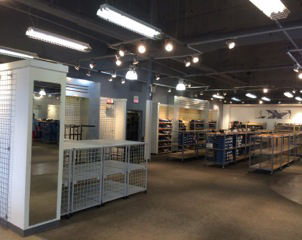 This complete package of excess pre-owned apparel store fixtures included nested display tables, garment racks, display cases, shoe racks, tie displays, wrap-stand/check-out counters, folded apparel merchandisers, wall cubbies, and more. Wood, laminate, and chrome finishes. 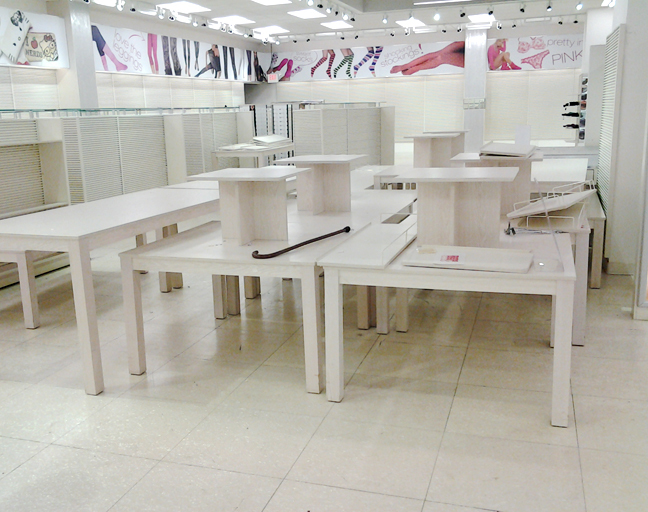 SOLD OUT: Excess Apparel & Accessory Store Fixture Liquidation. 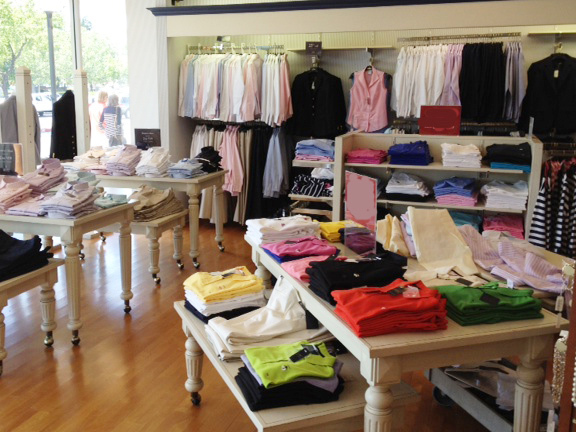 Excess apparel and accessory fixtures from a Jacksonville Florida area retail store RENOVATION. Beautifully finished upscale fixtures in EXCELLENT condition, perfect for any retail clothing store, accessory boutique, or department store. CLICK ON any photo to view larger image. BUNK Sections for Hanging or Folded Garments. 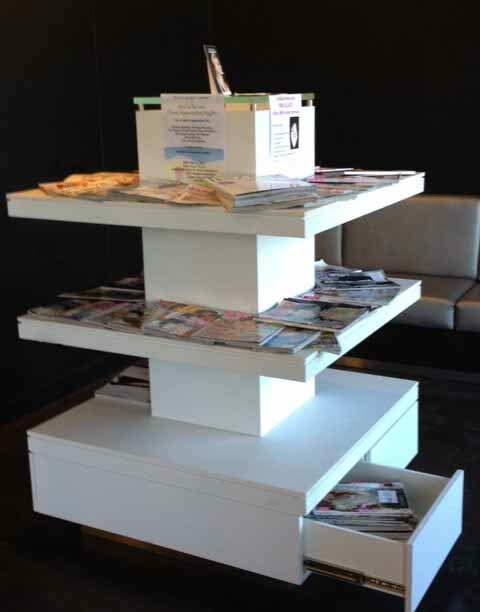 Unique Glass Top Display Tables with Interior Storage. 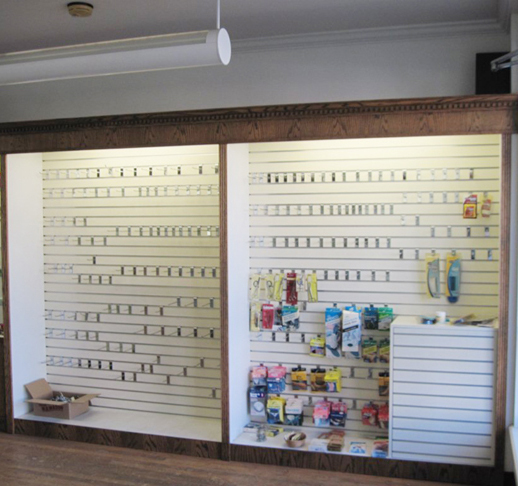 SOLD OUT: Retail Store Fixture Displays, EAS/Loss Prevention System. Excess assets no longer required by gift & toy shop are SOLD OUT. Inventory included EAS system, 2 or 4-sided slatwall displays, 3-tier display stand & cart, counter-side display, display case & cubes, glass display cubes, more. 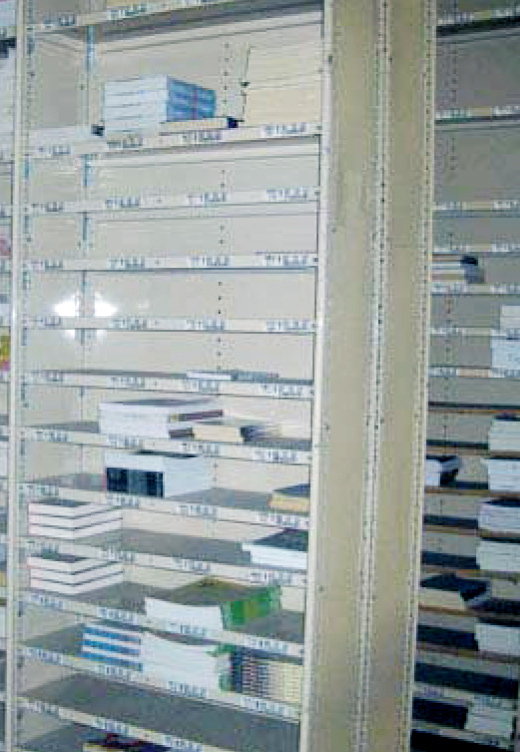 SOLD OUT: Pre-owned Earthquake-safe PHARMACY SHELVING package. 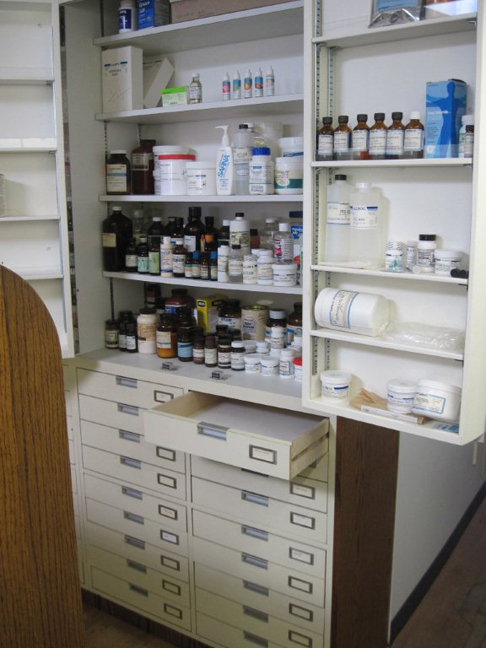 HEAVY-DUTY, pre-owned “California Cabinets” brand package of PHARMACY SHELVING and WORK SURFACE COUNTERS. 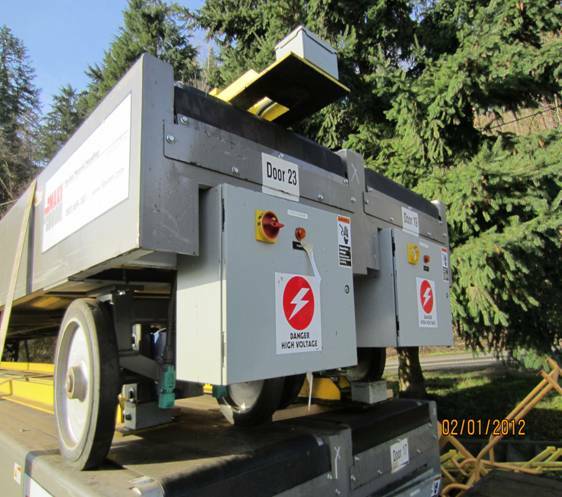 In service only 6 MONTHS, earthquake-safe. GREAT opportunity for any drug store expansion, or for a supermarket or other retailer planning to add a pharmacy department. 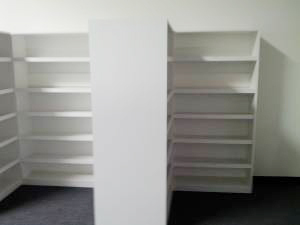 6’x 36″-4″-48″ shelving units. Selected units included a plate to give a “clean” side (for back-to-back configuration). 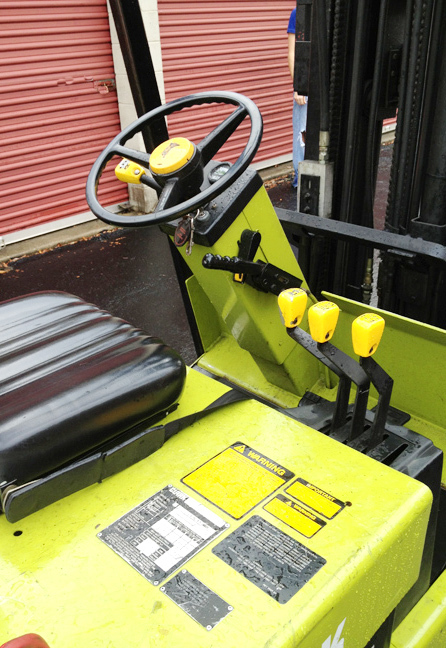 SOLD: Used CLARK Electric Forklift Liquidation. 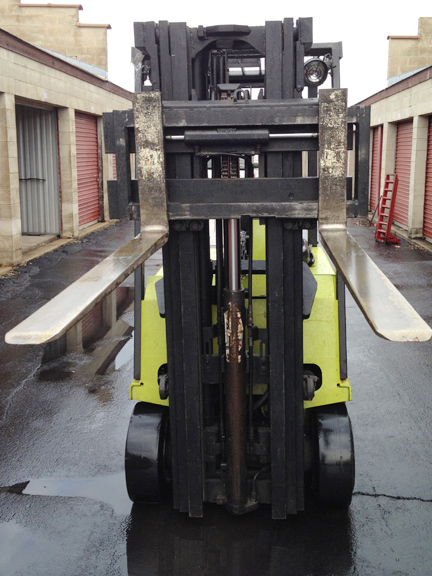 SOLD: Excess lift truck no longer required by a Chicago area business . 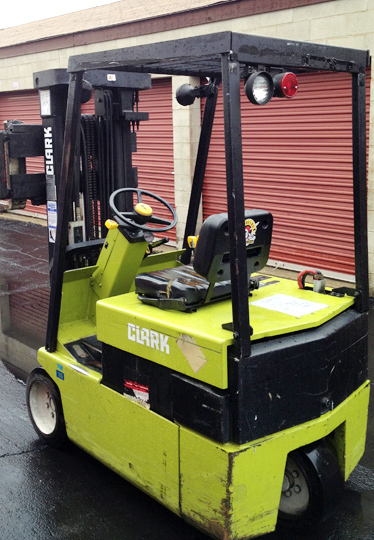 Used CLARK Model #TM15 electric forklift. 2475 LB capacity. W9200 Hours. Model #TM15, Type E, 36 volt, AH – 1120-6. 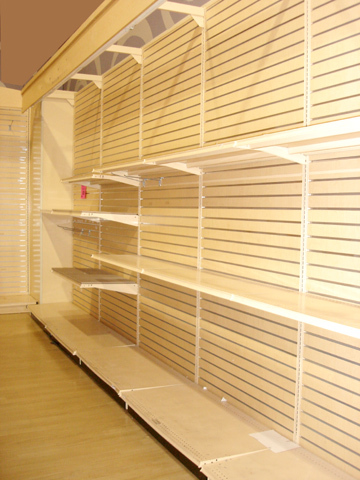 SOLD OUT: Used Retail Display Shelving & Fixtures MUST GO. 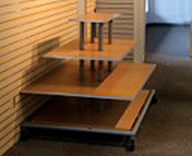 Used/pre-owned retail display shelving and fixtures no longer required by a West Coast retailer. An assortment of sleek white-finish fixtures to showcase merchandise and coordinate with ANY decor. 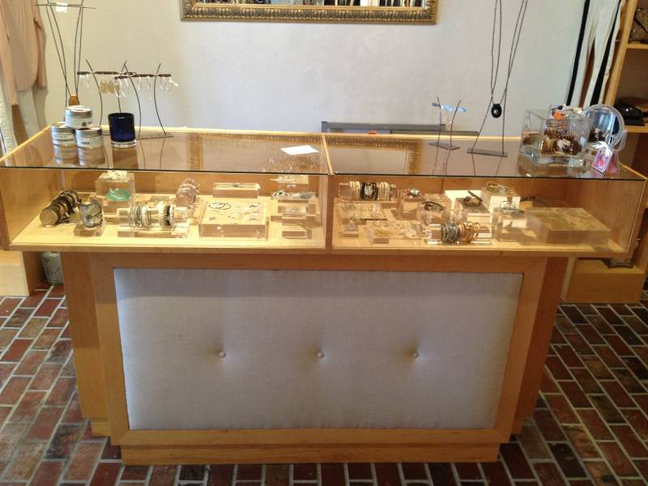 SALE CONCLUDED: High-end Home Furnishings/Accessory Store Fixtures. Closing Jacksonville FL upscale home furnishings/accessories store featured beautifully-detailed, Italian-made glass & wood high-end component fixtures from LOGIKA. Chrome nail-head trim. Components easily configure as free-standing or wall units to fit any retail space or application, and can be disassembled for easy transport. Original cost was $45,000 new. LOGIKA Component Parts: Glass Shelving, Wood Shelving (Cherry & Natural), Wing Wall Accents, Panels, Wood Shelving End Caps, 96″ Upright Supports, Baseboard Components, Crossbar Supports, Shelving Brackets, Display Hooks & Fixtures, P.O.S. Cash Drawer, Epson Receipt Printer, Zebra Price Label Printer, IBM POS Touch Screen Terminal, Apparel Racks, Telephone System, Signage, Acrylic Easels & Brochure Holders, Product Displays, Store/Wrapping Supplies, Track & Gallery Lighting, Poduct Displays, AND more. 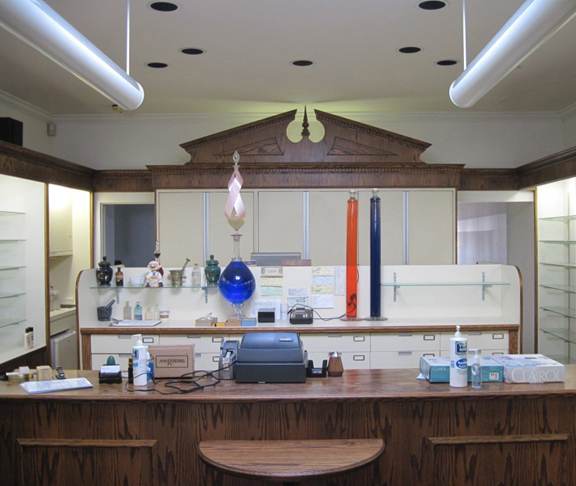 SOLD OUT: Excess Pharmacy Equipment & Store Fixture Liquidation Sale. AREA: Southampton NY (Long Island/New York City area). 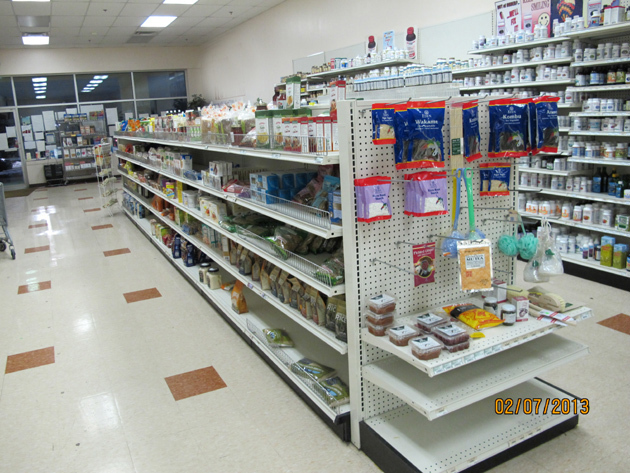 Pharmacy Shelving & Miscellaneous Fixtures. Slat Wall and Peg Hooks. 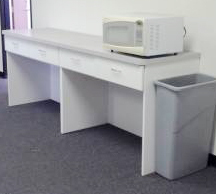 SOLD OUT: Excess Office Furniture Liquidation. 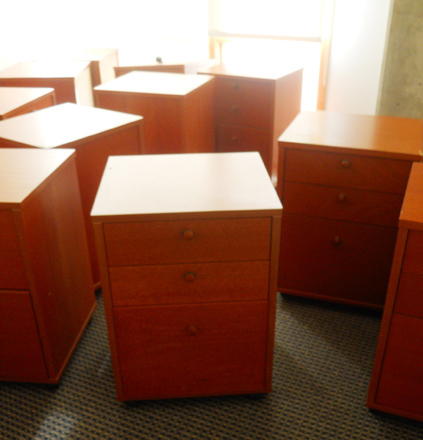 LARGE quantity of EXCESS used office furniture, including desks, conference tables, bookcases, shelving, office chairs, and drawers. 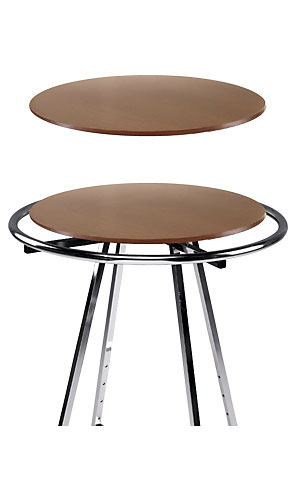 Rich wood, metal or fabric finishes in clean, modern designs. Liquidated for a FRACTION of the cost of NEW, due to relocation. 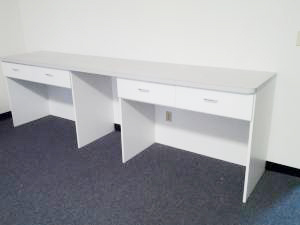 SOLD OUT: Corporate Office Furniture & Equipment Liquidation. 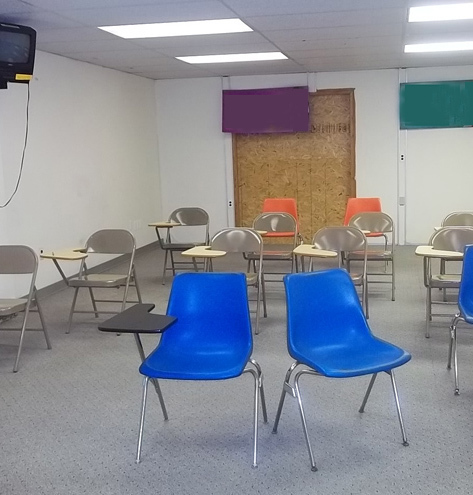 Inventory included Desks, Office Chairs, File Cabinets, Credenzas, Conference Tables, Computers, Printers, Cubicles, Phone Systems, Reception/Service Counter, Guest Seating, and MORE. 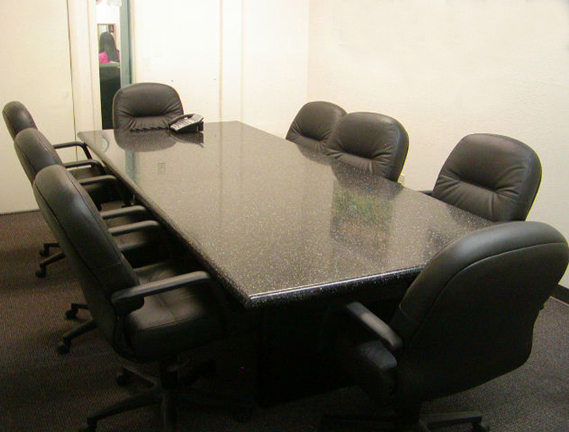 “Executive”, “Managerial” and “Secretarial” style office furniture in leather, laminate, wood, or upholstered finishes. Brands & makes included Steelcase, Herman Miller, Hon, Dell, HP, Epson, and Lucent. 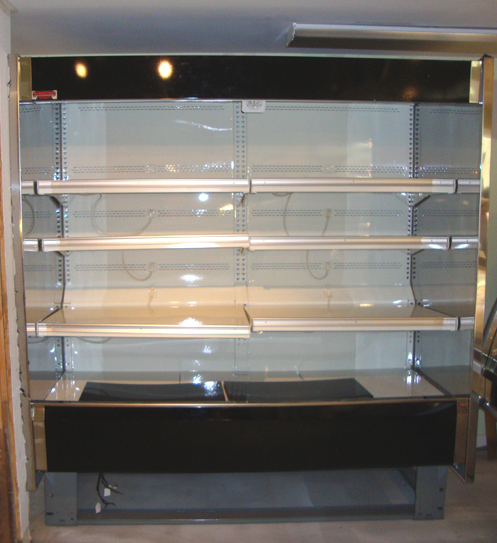 Inventory included full-view showcases, clothing/apparel display racks, mannequins, slatwall displays, display tables, rolling garment racks, jewelry spinners, accessory displays, shoe shelving, stock room shelving, cardboard baler, floor cleaning equipment, and more. 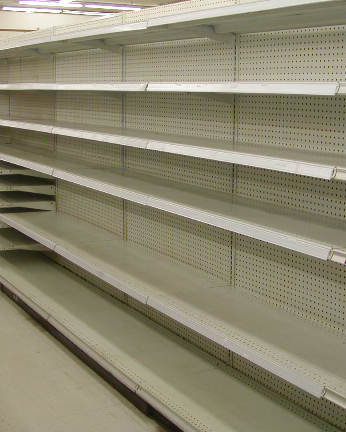 SOLD OUT: Supermarket / Grocery Store Fixture Liquidation. Inventory included gondola display shelving, deli and food prep equipment, walk-in & reach-in coolers & freezers, meat/butcher shop equipment, produce coolers, shopping carts & baskets, bakery equipment, pallet rack, conveyor check-out counters, POS equipment, more. 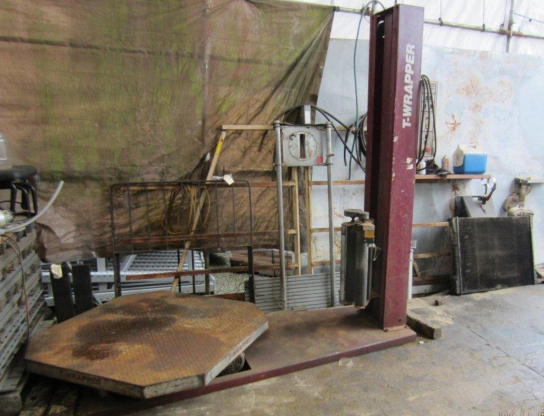 SOLD: Used RiveTier Transfer Rack/File System (with Mezzanine). 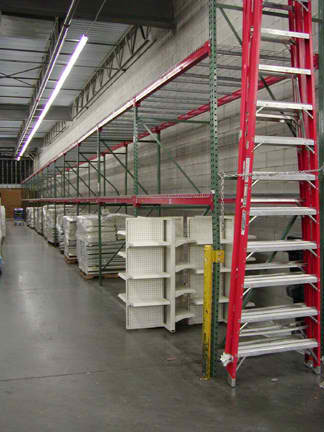 Pre-owned TRANSFER RACK/FILE SYSTEM (with mezzanine) no longer required by West Coast warehouse. . Storage Capacity=55,632 F.I. RiveTier boltless rack. 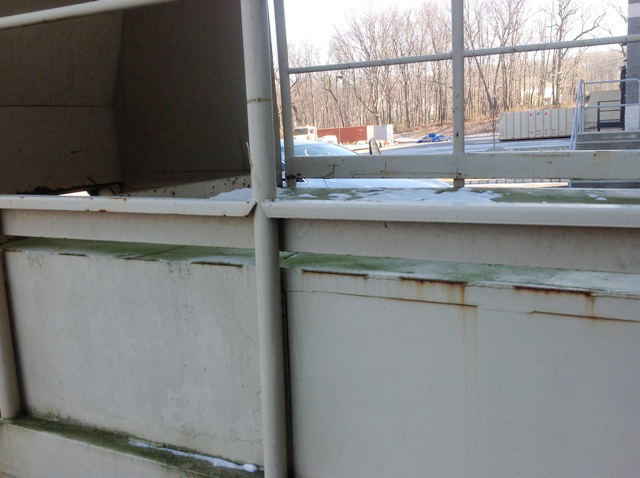 Features include GALVANIZED stairs and guardrail. 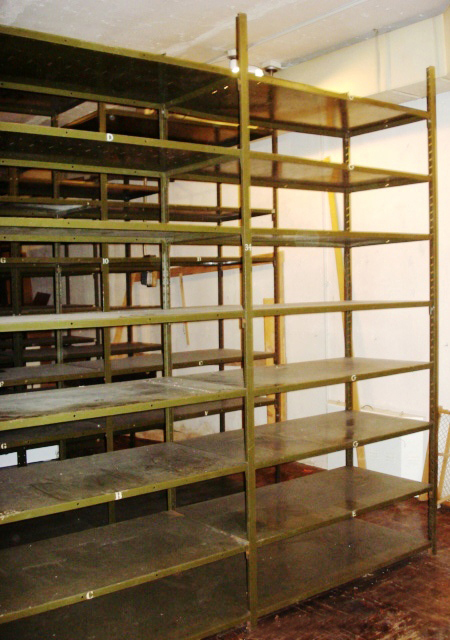 SOLD OUT: Military Grade Heavy-duty Industrial Metal Shelving. AREA: Stanfordville NY (Poughkeepsie NY/Danbury CT area). 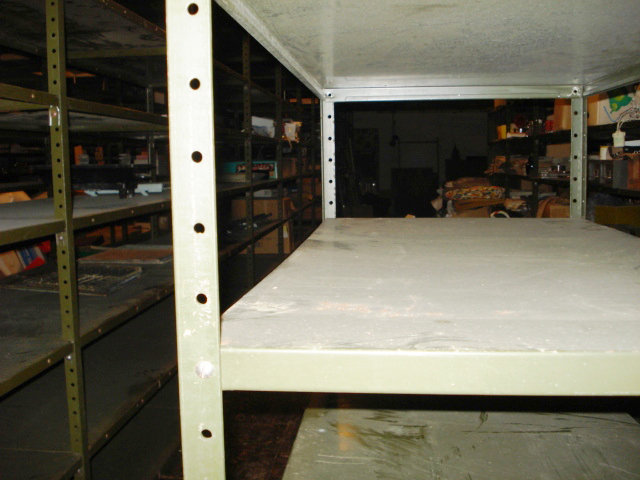 1950’s “Cold War” era heavy-duty box-style industrial metal shelving in EXCELLENT condition. Well-kept and used since the ’50’s in its present-day underground temperature-controlled storage facility for microfilm storage. “Army Green” finish has mellowed uniformly over the years. Strong, durable, versatile, and extremely sturdy construction features stand up in high-activity factory, warehouse or stockroom areas. 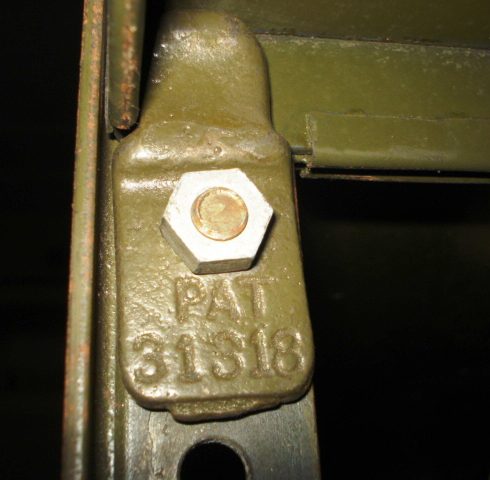 Rugged durability and staying power ideal for storing packages, parts, supplies, tools, inventory. 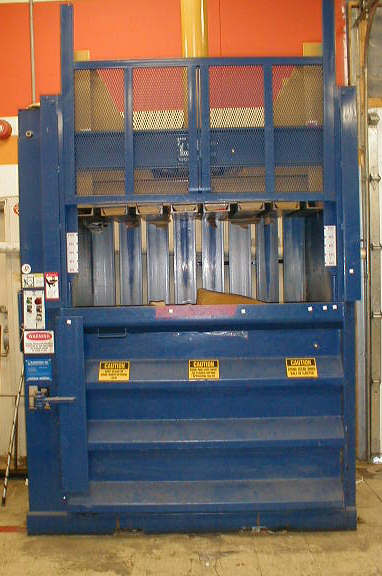 SOLD: 2 YD Trash Compactor. LIKE NEW, only 4 years old. AREA: Freehold NJ (Freehold Township/Monmouth County area). 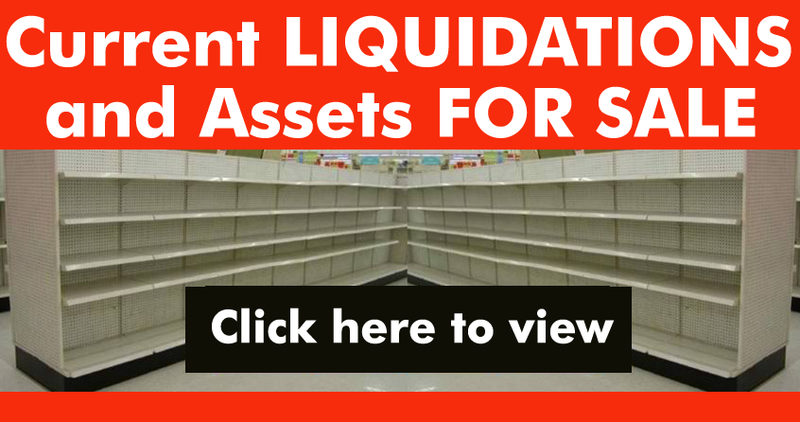 SOLD OUT: Grocery Store Fixtures & Supermarket Equipment Liquidation. 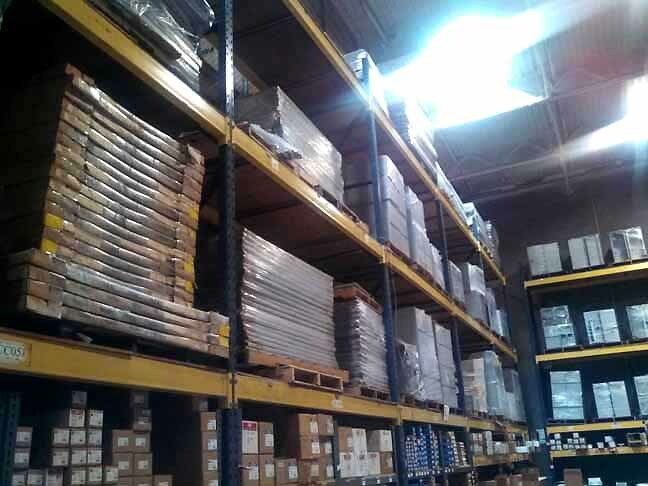 Inventory included commercial refrigeration/food storage, gondola display shelving, food prep equipment, pallet rack, produce displays, shopping carts, and much more. 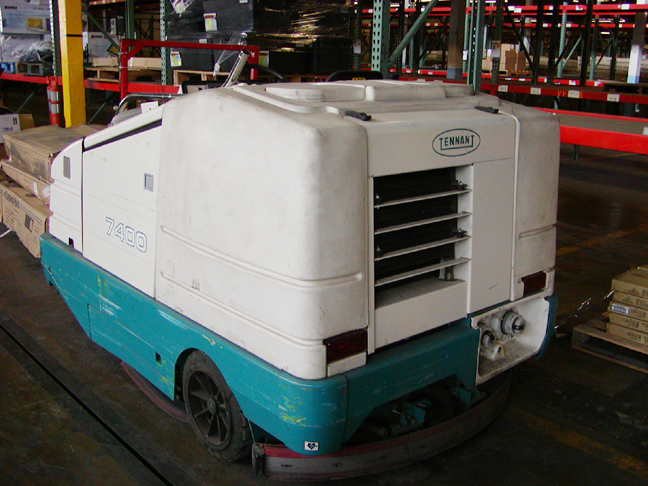 SOLD OUT: DISTRIBUTION CENTER/Warehouse Equipment Liquidation. 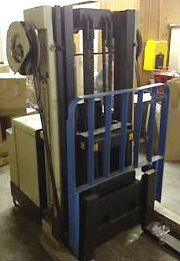 Inventory included pallet rack, SkyJack platform lift, power tools, floor scrubbers, step ladders, more. 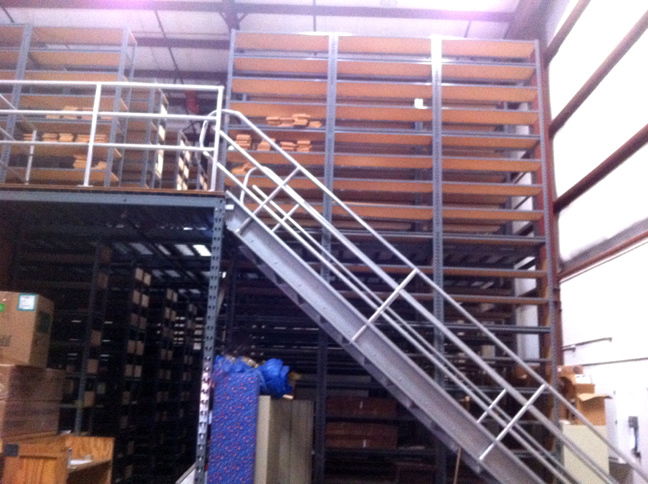 SOLD OUT: Used WESTERN PACIFIC Closed Steel Shelving. 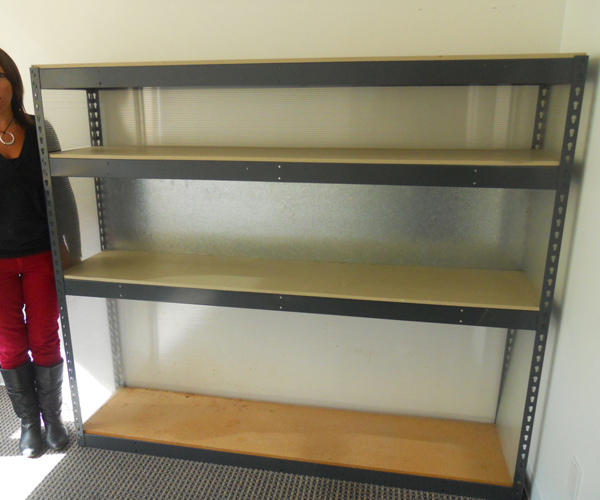 Pre-owned WESTERN PACIFIC closed steel shelving. Versatile storage solution perfect for organization & protection, and a clean, secure way to store small parts. 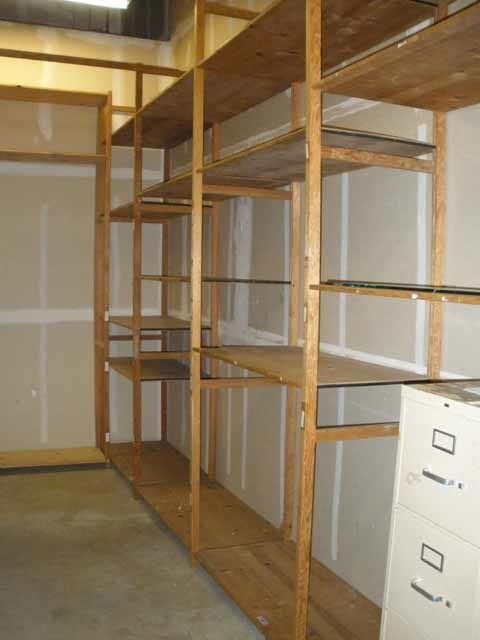 12″ deep x 36″ wide x 12′ high sections, 10 shelves included per section. 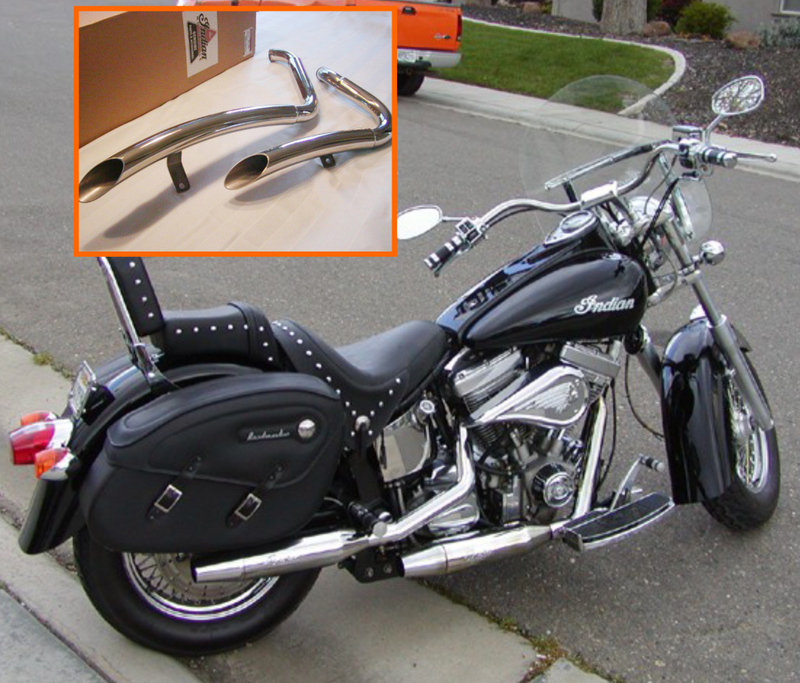 SOLD OUT: Indian Motorcycle Parts & Accessories Liquidation. From one U.S. Collector’s PERSONAL COLLECTION. Inventory included new and gently-used Indian motorcycle parts, apparel, and accessories: Fenders, Fuel Tanks, Swoop Pipes (War Talkers), Windshield, Solo & Double Seats, Seat Rails, Vintage-look Metal Signs, Embroidered Apparel (Shirts, Hats, Tees, Jeans), Bandanas, Rain Gear, and more. 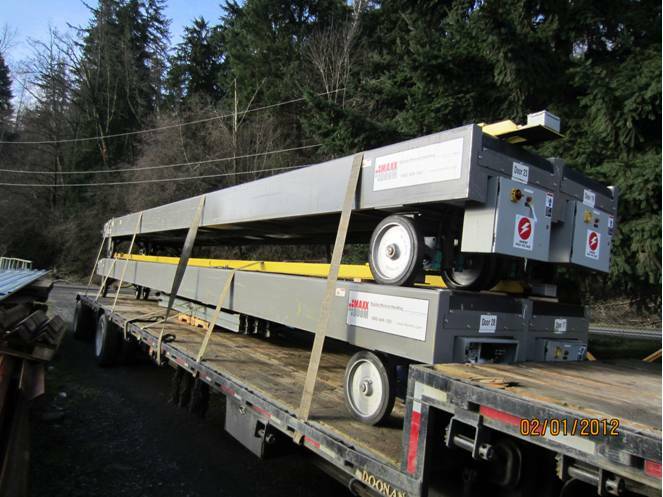 SOLD OUT: Used STRETCH WRAP MACHINE and Bar Stock Cradles. AREA: Tacoma area, Washington State. 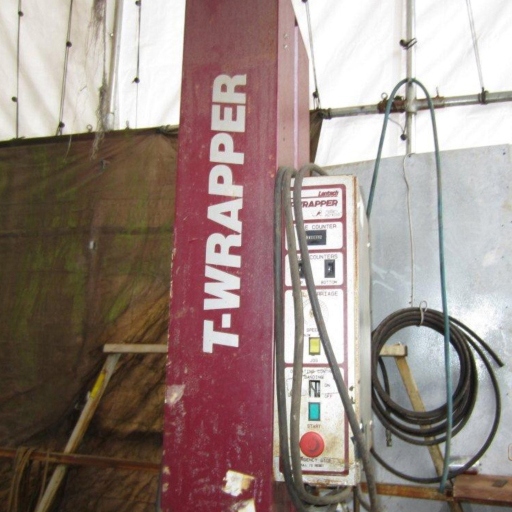 Pre-owned T-WRAPPER stretch wrap machine and large quantity of used bar stock cradles (no longer required in Washington State). Click on any photo to view larger image. 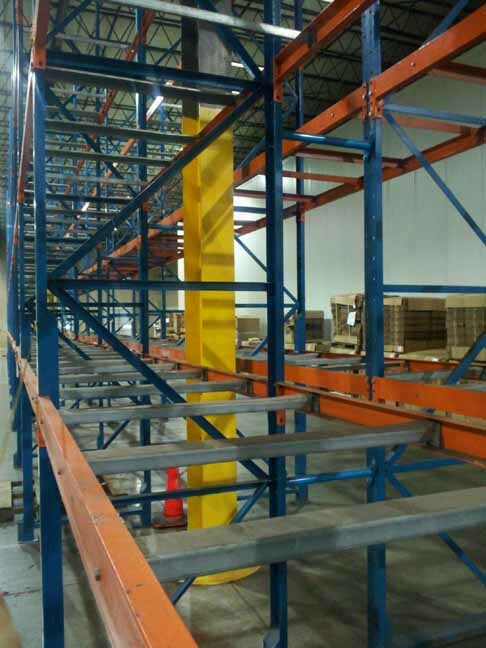 SOLD OUT: Used Teardrop PALLET RACK, STACK RACKS, and Conveyor. 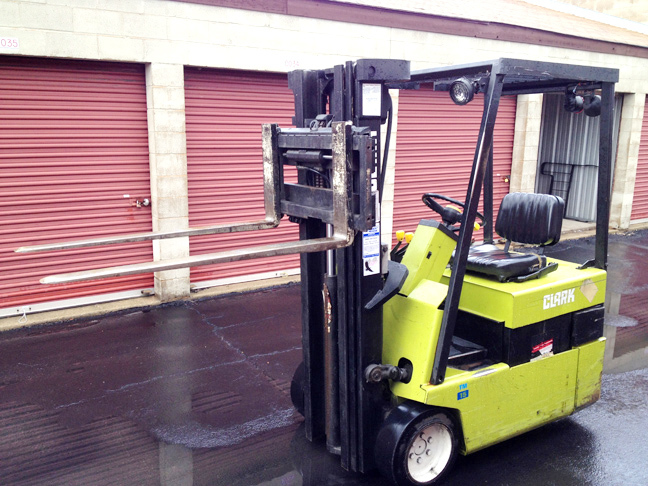 SOLD OUT: Warehouse Equipment Liquidation. 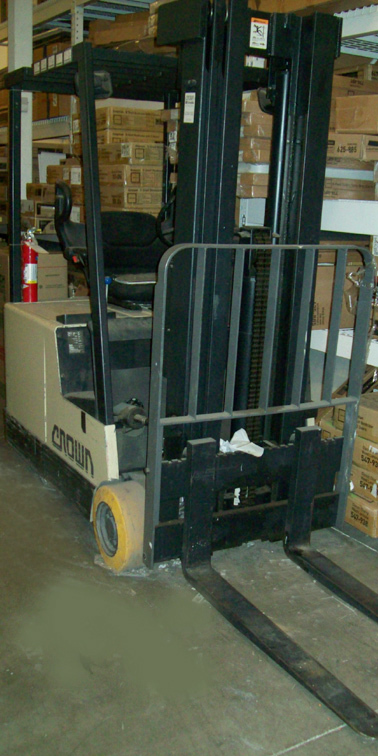 Inventory included pallet rack, conveyor, forklifts, pallet jacks, order picker, more. 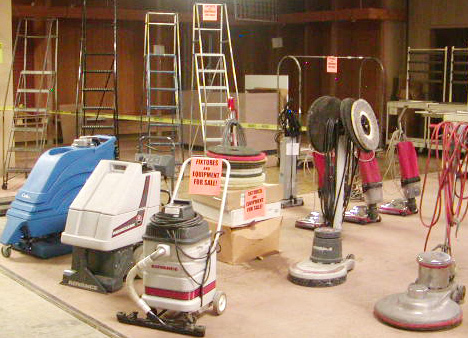 SOLD OUT: Commercial Landscape Equipment Liquidation. AREA: Lewiston ID/Missoula MT area. 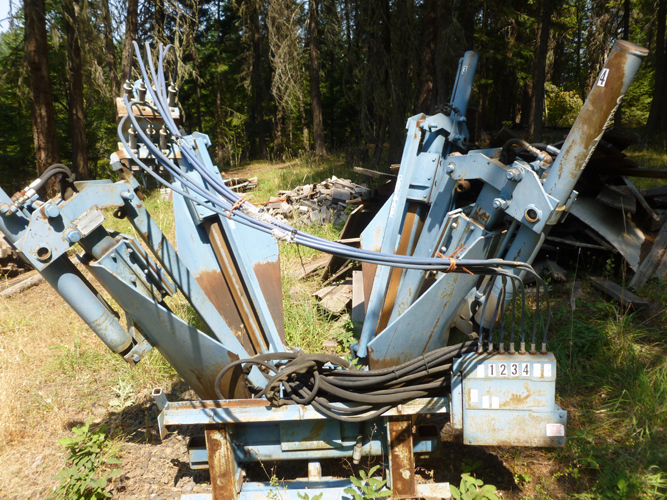 Used/pre-owned commercial CareTree Systems Inc. 4-blade TREE SPADE in Kooskia ID (Lewiston Idaho-Missoula Montana area) must go due to business closure. Click on any photo to view larger image. Similar models sell for over $10,000 if brand new. 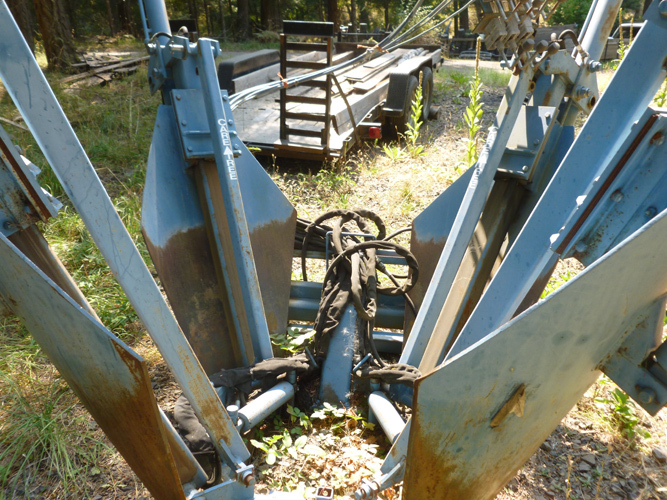 Tree spades are must-have equipment for any professional landscaping business, commercial nursery/tree business, or forestry operation. Used to evenly cut, lift, and transport larger trees for transplanting. 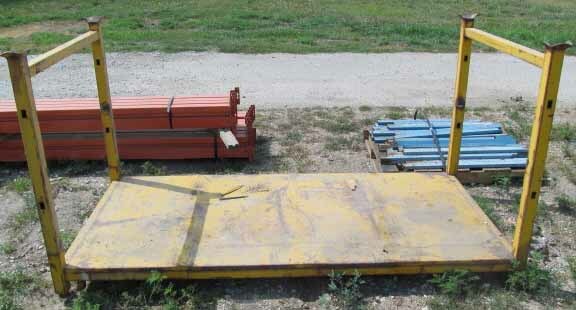 SOLD OUT: Used MAXXBOOM Drive-out Extendable Conveyors/Truck Unloaders. 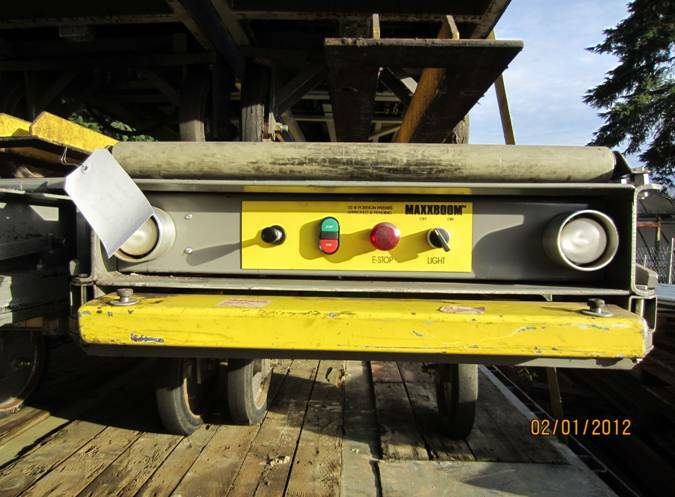 Pre-owned MAXXBOOM Drive-out Extendable Conveyors/Truck Unloaders.